No other living tradition can claim scriptures as numerous or as ancient as Hinduism; none of them can boast of an unbroken tradition as faithfully preserved as the Hindu tradition. Hindu literature is the most ancient and extensive religious writings in the world. Hindu religion is not derived from a single book. It has many sacred writings which serve as a source of doctrine. The most important texts include the Vedas, Upanishads, the Puranas, the Epics - Ramayana, Mahabharata and the Bhagavad Gita. Hinduism is very much a religion of revelation. Hindus are the most thoughtful people, and their literature is characterized by constant concern with humanity's spiritual destiny. In response to this concern they have created elaborate philosophical concepts and wrote great epic poems, narrative literature and fiction. These vast epics, and the four 'books' of the Vedas, were originally transmitted by a phenomenal human chain of memory, and only written down centuries after their actual compilation. This oral tradition still exists in India today. The early phase of the Vedic tradition in India is dated between 10,000 - 7,000 BCE. According to Professor Klaus K. Klostermaier: "Since ancient times India has been famous for its wisdom and its thought. The ancient Persians, Greek and Romans were eager to learn from its sages and philosophers. When, in the eighteenth century, the first translations of some Upanishads and the Bhagavad Gita became available to the West, European philosophers rhapsodized about the profundity and beauty of these writings. Here they encountered a fusion of philosophy and religion, a deep wisdom and a concern with the ultimate, that had no parallel in either contemporary Western philosophy or Western religion. Indian philosophy is highly sophisticated and very technical and surpasses in both in volume and subtlety." Sir William Jones was always impressed by the vastness of Indian literature. He wrote: "Wherever we direct our attention to Hindu literature, the notion of infinity presents itself." Hinduism has always laid great stress on Pramanas (the means and instruments of correct knowledge). Hindu philosophers have discussed at great lengths the science of Noetics. Max Muller says: "In thus giving the Noetics the first place, the thinkers of India seem to have again superior to most of the philosophers of the West." The Vedas are not puerile babblings of rustic troubadours, but sedate out-pourings of exceptional minds in quest of God. 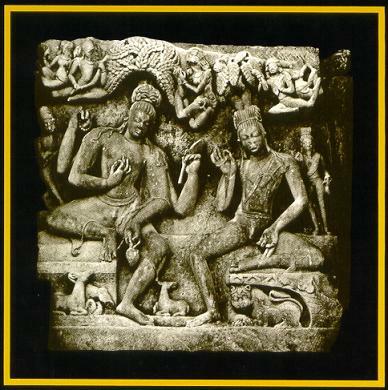 Early Rig Vedic hymns were composed between 6,000-1500 BCE. Like indestructible gems they have come down during many thousands of years in spotless perfection. From the Vedas they evolved the Upanishads, whose copious enquiries into the nature of man, the Universe, and God, strike us with speechless wonder. They evolved the most perfect language in the world, Sanskrit, with a scientific alphabet and perfected vocabulary, and a grammar which is itself a great work of art. Their intellectuals vying with each other, propounded six systems of philosophy explaining man, universe, and God, before which Aristotle's and Plato's theories look like juvenile endeavors, which fell flat on their own country-men. They discovered the Earth's dual motions, and studied the courses of constellations and stars, and founded the twin sciences of astronomy and astrology. They probed the human frame, and perfected a system of medicine for the welfare of the body, evolved the science of Yoga for the health of the mind, and the Tantra Shastra to develop the psychic and esoteric forces latent in man's being. 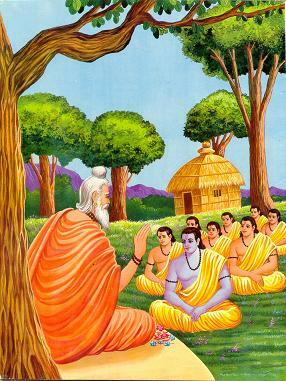 They brought out Dharma Sastras to guide man's conduct in society, Grihya Sutras to guide the conduct of house-holders, and a unique science, Meemamsa, prescribing sacrificial lore for the attainment of individual and national prosperity. They codified the laws of sanitation, town-planning, architecture, sculpture and enunciated the principles of music, dancing, and the art of love. They laid down principles of state-craft, and of the art of war, with human and animal strategy, with physical weapons, or shastras, and enchanted weapons or astras. The English knowing world began to read of the greatness of Indian civilization in the 18th century. Scholars, one after another, caught glimpses of its luster, and becoming curious, slowly unveiled the enveloping shroud and gaze with ever growing wonder at is astonishing extent. Russian, German, Italian, Swedish, French, and American intellectuals also turned their telescopes on the Indian sky during the period, and expressed their appraisal in no uncertain terms. But the bulk of the English educated public of India are still unaware of its rich past. The Sanskrit word for philosophy is darsan or 'seeing', which implies that Hinduism is not based merely on intellectual speculation but is grounded upon direct and immediate perception. This, in fact, distinguishes Indian philosophy from much of Western philosophical thought. The oldest and most important scriptures of Hinduism are the Vedas, which contain inspired utterances of seers and sages, who had achieved a direct perception of the divine being. The Vedas are considered to be eternal, because they are not merely superb poetic composition but represent the divine truth itself as perceived through the elevated consciousness of great seers. In general, Hindu scriptures may be classified into two divisions: Sruti scriptures and Smriti scriptures. Sruti in Sanskrit means "that which is heard." Thus the Vedas are the eternal truths that the Vedic seers, called rishis, are said to have heard during their deep meditations. The Vedas are not considered the works of the human mind, but an expression of what has been realized through intuitive perception by Vedic rishis, who had powers to see beyond the physical phenomena. As such, Vedas are considered of divine origin. The Vedic truths were originally transmitted by the rishis to their disciples over thousands of years. 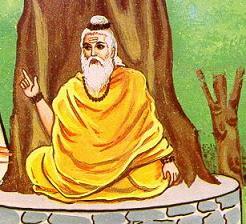 At a later date, these were compiled by Sage Vyasa for the benefit of future generations. India's teachings are not speculative. They are based on divine revelations. Indeed, the revelations are so cosmic that they approach more closely the findings of physics and astronomy than the pious pronouncements of preachers. The rishis made claims so cosmic that even modern physics seems only to be catching up with them and realizing, after every scientific breakthrough, that the ancients were there long before them. Sruti include the Vedas (Rig, Yajur, Sama and Atharva) and the Bhagavad Gita. The Vedas are the primary scriptures of Hinduism. Each of the four Vedas consists of four parts: Samhitas, Brahmanas, Aranyakas, and Upanishads. Smriti means "that which is remembered." Smriti scriptures are derived from the Vedas and are considered to be of human origin and not of divine origin. They were written to explain and elaborate the Vedas, making them understandable and more meaningful to the general population. All authoritative writings outside the Vedas are collectively referred to as Smriti. Smriti inlcude the Dharma Shastras, Nibhandas, Puranas, The Epics, Agamas or Tantras, Darshanas and Vedangas (Upa Vedas). According to Alain Danielou distingused Orientalist, " The Puranas provide genealogies, which go back to the sixth millennium B.C. E. and are probably largely authentic. The stories and descriptions of the various regions of the earth and the various civilizations living on the "seven continents" provide priceless documentation on the world's oldest civilization." Note: Each of the four Vedas consists of four parts: Samhitas, Brahmanas, Aranykas, and Upanishads. The Bhagavad Gita is a part of the Epics (The Mahabharata). (image source: The Hindu Mind - By Bansi Pandit). Arthur Anthony Macdonell (1854-1930) in his History of Sanskrit Literature tells us that 'the importance of Indian literature as a whole consists of its originality. When the Greeks towards the end of the fourth century B.C. came to the north-west, the Indians had already worked out a national culture of their own, unaffected by foreign influence. Sir William Jones was always impressed by the vastness of Indian literature. He wrote: "Wherever we direct our attention to Hindu literature, the notion of infinity presents itself." (source: Eminent Orientalists: Indian European American - Asian Educational Services. p. 21). To the Hindu, Shruti is what cannot be thought up by the limited human intellect, but is of God. It is what is forever valid, never changes, is not dependent on the limited capacity for understanding of any one historical person. The Hindu for this reason is proud not to need a historical founder. The founder and foundation of the Vedas and the Upanishads is the Brahman itself, is what is indestructible and timeless. (source: Vedanta: Heart of Hinduism- By Hans Torwesten p. 23). The Vedas and the Upanishads are to India what the Crown and Scepter are to an anointed king. They are India's proudest and most ancient possessions. They are the world's oldest intellectual legacies. They are the only composition in the universe invested with Divine origin, and almost Divine sanctity. They are said to emanate from God, and are held to be the means for attaining God. Their beginnings are not known. They have been heirlooms of the Hindus from generation to generation from time immemorial. When Europeans first came to know of them, they roused amazement. Guigault of France exclaimed: "The Rig Veda is the most sublime conception of the great highway of humanity." (source: Sanskrit Vistas - By J. R. Josyner p. 1). Professor F. Max Muller says: "The Vedic literature opens to us a chapter in what has been called the education of the human race, to which we can find no parallel anywhere else." (source: India: What can it teach us - By F. Max Muller p. 89). Refer to Internet Sacred Texts on Hinduism and Stotra Rathnas. The Vedas (Book of Knowledge) are the greatest legacy of India, a prodigious body of verse, philosophy and hymns that is among the world's oldest written sacred scriptures. The Vedas are the discoveries of the laws of nature, the world and the being living in it and the Ultimate Truth. They are called apauruseya grantha (authorless works) as they are not books composed by men at a particular period of time. Ancient sages received these eternal Truths as revelations in meditation. The Four Vedas are the primary texts of the spiritual and religious records of the ancient culture and teachings of India. The four Vedas are the Rig, Yajur, Sama and Atharva Vedas. The religion of the Rig Veda is well known. 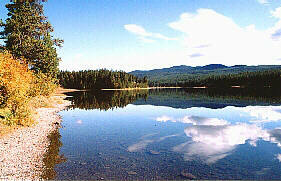 It is pre-eminently the worship of Nature in its most imposing and sublime aspect. The sky which bends over all, the beautiful and blushing dawn which like a busy housewife wakes men from slumber and sends them to their work, the gorgeous tropical sun which vivifies the earth, the air which pervades the world, the fire that cheers and enlightens us, and the violent storms which in India usher in those copious rains which fill the land with plenty, these were the gods whom the early HIndus loved to extol and to worship. Such is the nature-worship of the Rig Veda, such were the gods and goddesses whom our forefathers worshipped more than four thousand years ago on the banks of the Saraswati. The conception of the nature-gods and the single-hearted fervency with which they were adored, argue the simplicity and vigor of a manly race, as well as the culture and thoughtfulness of a people who had already made a considerable progress in civilization. He wrote: "I seek a light that shall be new, yet old, the oldest indeed of all lights...I seek not science, not religion, not Theosophy but Veda - the truth about Brahman, not only about His essentiality, but about His manifestation, not a lamp on the way to the forest, but a light and a guide to joy and action in the world, the truth which is beyond opinion, the knowledge which all thought strives after - yasmin vijnate sarvam vigna - tam (which being known, all is known); I believe it to be the concealed divinity within Hinduism..." "I believe the Veda to be the foundation head of the Sanatan Dharma; I believe it to be the concealed divinity within Hinduism, - but a veil has to be drawn aside, a curtain has to be lifted. I believe it to be knowable and discoverable. I believe the future of India and the world to depend on its discovery and on its application, not, to the renunciation of life, but to life in the world and among men. I believe the Vedas to hold a sense which neither mediaeval Indian or modern Europe has grasped, but which was perfectly plain to the early Vedantic thinkers." "The mind of ancient India did not err when it traced back all its philosophy, religion and essential things of its culture to the seer-poets of the Vedas, for all the future spirituality of her people is contained there in seed or in first expression." (source: The Vision of India - By Sisirkumar Mitra p. 59). The Rishis were the revered pioneers of the Hindu religion, and pre-eminent among them are Vishvamitra and Vasistha. The great Rishis of the Vedic age composed the hymns, fought their wars, and ploughed their fields; but they were neither Brahmins, nor Kshatriyas nor Vaisyas. The hymns of the Rig Veda speak of the Punjab alone - India beyond the Punjab is unknown to the Rig Veda. The banks of the distant Ganga and Jumna are rarely alluded to; the scenes of war and social ceremonies are the banks of the Saraswati and her tributaries. This was the Hindu world when the hymns were composed. "The Hindus have received their religion through revelation, the Vedas. They hold that the Vedas are without beginning and without end. It may sound ludicrous, that a book can be without beginning or end. But by the Vedas no books are meant. They mean the accumulated treasury of spiritual laws discovered by different persons at different times. Just as the law of gravitation acted before its discovery by humanity, and would continue to act if all humanity forgot it, so is it with the laws that govern the spiritual world. The discoverers of these laws are called Rishis, and we honor them as perfected beings. Now the Vedas teach us that creation is without beginning or end. Science has proved to us that the sum total of cosmic energy is always the same. They were written, nobody knows at what date, it may be 8,000 years ago, in spite of all modern scholars may say; it may be 9,000 years ago. Not one of these religious speculations is of modern date, but they are as fresh today as they were when they were written..."
nor air, nor sky, nor anything. What covered all? nor change to night and day." Now first arose desire, the primal seed of mind. It is a very peculiar expression; the poet ends by saying that "perhaps He even does not know." (source: Hinduism - By Swami Vivekananda p. 2 -35). The metaphysical agony, which alone makes man great, bursts forth in the famous words of the Rig Veda. These words of spiritual yearning, metaphysical unease and intellectual skepticism set the tone of India's cultural growth. The seers of the Rg Veda believe, in a truth, a law which governs our existence, which sustains the different levels of our being, an infinite reality, ekam sat, or which all the different deities are but forms. (source: East and West in Religion - By S. Radhakrishnan p. 21-22). The Vedas are the most ancient scriptures in the library of consciously evolving humanity. The Vedas are the direct experience and revelations of the rishis of the hoary past. The Vedas are meant for the lovers of eternal Time. The oldest Indian literary documents are the four Vedas; the word means sacred knowledge or lore. These texts include hymns, liturgical instructions, and explanatory theological and philosophical courses. These vast and complex works reflect a long development in philosophical and religious thought. The Vedas are regarded as the foundation of the Indian Culture and the Rishis of Vedas have been revered throughout the ages in India as having heard the truth and revealed it and thus given perennial wisdom to guide the development of the future. One of the most dominant ideas of Indian culture has been that of Dharma, and this has been a consequence of the Vedic discovery of the r'ta or the Right. The right of law of this automatic harmony is the r'ta. The Vedas are the brilliant product of intuitive insight. The original seers who "saw" them were and will ever remain anonymous, for this was not the age of unbridled individualism. Here you have the quintessence of classical Indian philosophy. Thinking with your heart and loving with your mind. The Vedas were the brilliant product of intuitive insight, not of the logical intellect. Known only orally at first, transmitted by word of mouth from master to discipline, later written down. The original seers - 'rishis' who 'saw' them were and will ever remain anonymous, for this was not an age of unbridled individualism. The chief sacred scriptures of the Hindus, the Vedas, register the intuitions of the perfected souls. They are not so much dogmatic dicta as transcripts from life. They record the spiritual experiences of souls strongly endowed with the sense for reality. They are held to be authoritative on the ground that they express the experiences of the experts in the field of religion. The Vedas bring together different ways in which the religious-minded of that age experienced reality and describe the general principles of religious knowledge and growth. The experiences themselves are of a varied character, so their records are many-sided (visvatomukham) or 'suggestive of many interpretations' (anekarthatam). (source: The Hindu View of Life - By S. Radhakrishnan p. 5-6). Sir William Jones called the Vedas as the fountain of Indian literature: "From the Vedas are immediately deduced the practical arts of Surgery and Medicine, Music and Dancing, Archery, which comprises the whole art of war, and Architecture, under which the system of mechanical arts is included." Dr. Nicol Macnicol says, the beginning of 'the brave adventures made so long ago and recorded here, of those who seek to discover the significance of our world and man's life within it...India here set out on a quest which she has never ceased to follow." (source: The Discovery of India - By Jawaharlal Nehru p. 79). Refer to Internet Sacred Texts on Hinduism and Stotra Rathnas. The Vedas are said to be anadi (beginningless) and apaurasheya (not thought and taught by men). The Rig Veda says: The Hindu doctrine is that the mentioning of the sage and the metre and the deity in respect to a Vedic hymn (mantra) does not mean that the sage composed the mantra as a piece of literary composition. The sage merely had it revealed to him in his vision as the result of his purity and meditation. Professor Max Muller in his book, India: What It can Teach Us says: "In the history of the world, the Vedas fill a gap which no literary work in any other language could fill. I maintain that to everybody who cares for himself, for his ancestors, for his intellectual development, a study of the Vedic literature is indeed indispensable." Some Vedic hymns paint the exquisite glories of the natural world: the preternatural beauty of predawn light, its rosy fingers holding the iridescent steel-blue sky; some celebrate the welcome cool of evening, the scented breezes of a calm and refreshing night, its basalt dome studded with shimmering pearls and diamonds. Beauty permeates them, a reflection of Truth. The Vedas go much further in outlining the nature of reality than any other religious texts still in use. Other hymns concentrate on different aspects of nature's wonder, very specific in their knowledge of the great cycles that sustain life. Vedic writings detail a scientific knowledge of the rain cycle that startles with its accuracy. The Vedic songs represent the most amazing celebration of life that has ever been created. The joy and wonder in life which was felt by those early and vigorous peoples who sang the Vedas. The Vedas testify to a strong urge in Man towards unity, a longing to arrive at a conception that is both totally Divine and human. This dynamic process has not yet ceased. No merely naturalistic explanation of the worship of the God as natural powers will do justice to texts or to the sophistication of Vedic culture. (source: The Vedic Experience: Mantramanjari (An Anthology of the Vedas for Modern Man) - By Raimundo Panikkar p. 53-123). The Vedas emphasize that the internal suksmasarira, the finer or subtle body of man, the equivalent of "soul" in modern thought, is of transcendental importance; and that suksma-sarira is of the nature of infinite existence and infinite consciousness. In this luminous philosophy, material substance is wholly insignificant. Compare the observations of Einstein: "We may therefore regard matter as being constituted by the regions of space in which the field is extremely intense...There is no place in this new kind of physics both for the field and matter, for the field is the only reality." (source: India's priceless Heritage - By Nani Palkiwala p. 6-7). An 18th century manuscript of the Rigveda ("Wisdom of the Verses"), the earliest and most auspicious of the four Vedas. "This homage is to the ancient-born Seers, to the ancient makers of the Path." - Rig Veda X. 14-15. The Glory of the Divine Sun! May He inspire our reflections!" - Rig Veda II. 62. 10). "You shine, all living things emerge. You disappear, they go to rest. Recognizing our innocence, O golden-haired Sun, arise; let each day be better than the last." Rig Veda (X, 37, 9). The Rig Veda is the Veda par excellence, the real Veda that traces the earliest growth of religious ideas in India. These hymns were composed between 6,000-1500 BCE. It is in poetical form, has one thousand twenty eight poems or hymns called Samhita. It is so much full of thought that at this early period in history no poet in any other nation could have conceived them. The sublimity, the nobility, the natural justice, the equality, the love and welfare of all humanity as a whole is the theme of the Rig Veda. The Vedic God has no partisan attitude of the jealous vindictive God, who is ever ready to please and help his own people by hurling disease, death and destruction on their enemies in return for sacrifices. Jawaharlal Nehru wrote: "Rig Veda is the earliest book that humanity possesses. Yet behind the Rig Veda itself lay ages of civilized existence and thought during which had grown all other civilizations..."
(source: The Discovery of India - By Jawaharlal Nehru Oxford University Press. 1995. p. 43). This merging with the Eternal, this inner transformation, this direct experience of Truth – these are the goals of which the Vedic sages speak. They explain the nature of the universe, of life, while admitting that Creation itself is the one unknowable mystery. To the Vedic sages, creation indicated that point before which there was no Creator, the line between indefinable nothingness and something delineated by attributes and function, at least. Like the moment before the Big Bang Theory. These concepts preoccupy high wisdom, the Truth far removed from mere religion. Recent research and scholarship make it increasingly possible to believe that the Vedic era was the lost civilization whose legacy the Egyptians and the Indians inherited. There must have been one. There are too many similarities between hieroglyphic texts and Vedic ones, these in turn echoed in a somewhat diluted form and a confused fashion by the authors of Babylonian texts and the Old Testament. Yet the Vedas go further, being philosophy, or really spiritual sciences, rather than myth. One can almost detect a touch of irony in the last question of this hymn which ends this verse. Who truly knows, who can honestly say where. And where it will vanish to at the End? After the birth of Creation. Who then could know where our universe really came from? But does even He know? " The philosophical and mystical depth of this hymn is unsurpassed. Paul William Robert has written: "The Bible begins with the Creation. Before the Creation, however, there was the Creator, but does even He know what was there before He existed ? Long before such philosophical questions occurred to other historical peoples, Vedism posited the existence of something more ultimate than the one God. Whatever must have created Him. That is presuming the absolute and basic reality. Or is it? This is mysticism that is simultaneously metalogic and the kind of thing those bardic sages living some twenty-five thousand years ago thought about a great deal, according to Hindu tradition. The Vedas are the very first compositions mankind produced dating back at least twenty thousand years. Most orthodox historians and anthropologists strongly dispute such a view. They confuse writing with civilization and deny meaningful history to any people who did not leave a written record. A rich culture does not necessarily depend on writing, as the Celtic civilization proves. The hymns are the most sophisticated, most profoundly beautiful, and most complete presentations of what Aldous Huxley termed the “perennial philosophy” that is at the core of all religions. In modern academia, of course, there is not supposed to be any “ancient wisdom”. The Vedas go much further in outlining the nature of reality than any other religious texts still in use. Some Vedic hymns paint the exquisite glories of the natural world: the preternatural beauty of predawn light, its rosy fingers holding the iridescent steel-blue sky; some celebrate the welcome cool of evening the scented breeze of a calm and refreshing night, its basalt dome studded with shimmering pearls and diamonds. Beauty permeates them, a reflection of Truth. The Vedas hold within them enough information to rebuild human civilization from scratch, if necessary. I think someone did believe that might be necessary one day. (source: Empire of the Soul: Some Journeys into India - By Paul Williams Robert p.299 -325).
" Om bhūr bhuvah svah tat savitur varēnyam bhargō dēvasya dhīmahi dhiyō yō nah pracōdayāt"
His chariot drawn by prancing horse, Surya, the Sun god rides the sky to a chorus of worshippers. O splendid and Effulgent sun, May your radiance enlighten this craving mind. (image source: Splendors of the Past: Lost Cities of the Ancient World - National Geographic Society. p.186-190). Battlestar Galactica - The Sky One version of the title sequence for season one featured a Hindu mantra, the Gayatri Mantra, taken from the Rig Veda. In the U.S. , the music was an original instrumental piece by composer Bear McCreary called "Two Funerals" originally written for the episode "Act of Contrition". As of season two, the main title sequences in all territories where the show airs now use the Sky One title sequence, the Gayatri Mantra version written by miniseries composer Richard Gibbs. (image source: The Splendour That Was 'India' - By K T Shah). The Aryas worshipped Nature. They were fascinated by their natural surroundings. Gods representing the forces of nature are mentioned in the hymns of Rig Veda. Rta was the term used to mean the natural law of the cosmic order and morality. It was the regulator of the whole Universe. 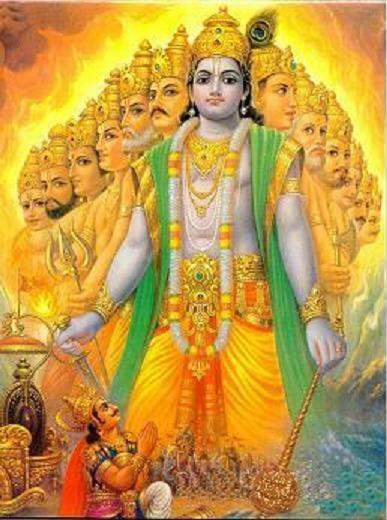 Dyaus, sky, Prithvi, earth, Varuna, the sky god and protector of Rta and Indra, Savitri, Mitra and Pushan represented different powers of the Sun such as heat, light and nourishment. 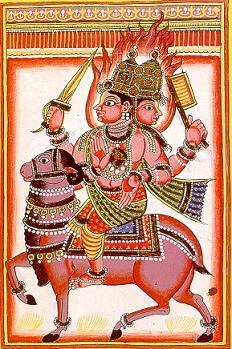 Vishnu was the symbol of swift movement while Rudra amd Maruts were the gods of storm and winds. Shiva was the later name given to Rudra. 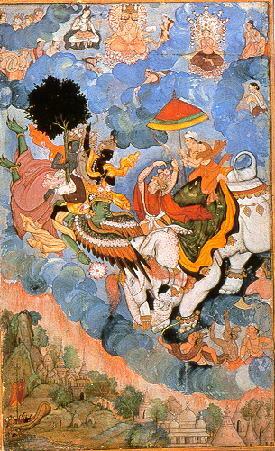 Vayu and Vata were other gods of winds while Parjanya was the god of rain. There were gods on earth also. Agni was an important deity. Soma was regarded as essential for sacrifice. Saraswati as river goddess on earth. But the most loved goddess was Usha (Dawn) belonging to both earth and heaven. Some of the most beautiful hymns are addressed to Ushas. (source: Ancient Indian History and Culture - By Chidambara Kulkarni Orient Longman Ltd. 1974. p.43-44). The Yajur Veda, containing 3,988 verses, is a compilation of mantras and methods for use by priests in performing Vedic rituals and sacrifice. The Atharva Veda, a unique collection of 5,977 verses was used to satisfy the daily needs of the people. This included verses deemed necessary for success in agriculture, trade, progeny, health, and general welfare. Other verses are designed to assist in procuring medicine and fighting one's enemy. The Sanskrit word Ayurved means medicine. The Ayurvedic system of medicine, based upon the use of herbs for the treatment of disease, has its roots in the Atharva Veda. Format of the Vedas - Each Vedas is divided into four main sections: (a) Samhitas or mantras (b) Brahmanas, (c) Aranyakas or "forest books" (d) Upanishads. Guigualt says: "The Rig Veda is the most sublime conception of the great highways of humanity." On July 14, 1882 Mons Leon Delbios said in a paper read on the Vedas when Victor Hugo was in the chair, says: "There is a no monument of Greece or Rome more previous than the Rig Veda." When Voltaire was presented with a copy of the Yajurveda he said, "It was the most precious gift for which the West has been for ever indebted to the East." (source: The Soul of India - By Satyavrata R. Patel p. 76-77). F. Max Muller wrote: "In the history of the world, the Veda fills a gap which no literary work in any other language can fill." (source: India: What can it teach us? - By Max Muller p. 121). "Precious stones or durable materials - gold, silver, bronze, marble, onyx or granite - have been used by ancient people in an attempt to immortalize themselves. Not so however the ancient Vedic Aryans. They turned to what may seem the most volatile and insubstantial material of all - the spoken word ...The pyramids have been eroded by the desert wind, the marble broken by earthquakes, and the gold stolen by robbers, while the Veda is recited daily by an unbroken chain of generations, traveling like a great wave through the living substance of mind. .."
"The Rig Veda is a glorious song of praise to the Gods, the cosmic powers at work in Nature and in Man. Its hymns record the struggles, the battles, and victories, the wonder, the fears, the hopes, and the wisdom of the Ancient Path Makers. 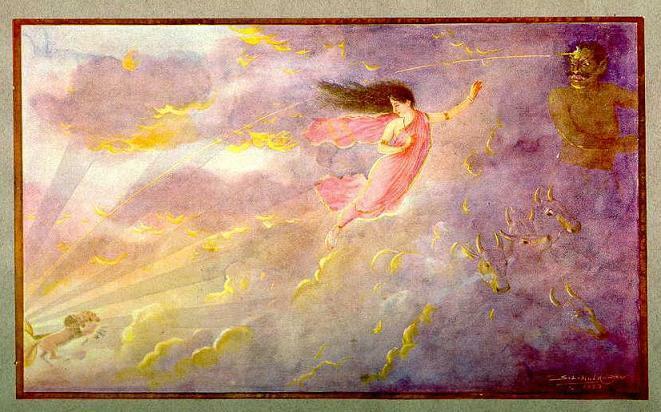 (source: Hymns from the Rig Veda - By Jean LeMee - Illustrator Ingbert Gruttner ISBN: 0394493540 and ASIN 0224011812). What extracts from the Vedas I have read fall on me like the light of a higher and purer luminary, which describes a loftier course through purer stratum. It rises on me like the full moon after the stars have come out, wading through some far stratum in the sky." "Whenever I have read any part of the Vedas, I have felt that some unearthly and unknown light illuminated me. In the great teaching of the Vedas, there is no touch of sectarianism. It is of all ages, climes and nationalities and is the royal road for the attainment of the Great Knowledge. When I am at it, I feel that I am under the spangled heavens of a summer night." He also admitted that, "The religion and philosophy of the Hebrews are those of a wilder and ruder tribe, wanting the civility and intellectual refinements and subtlety of Vedic culture." Thoreau's reading of literature on India and the Vedas was extensive: he took them seriously. "Vedanta is the most impressive metaphysics the human mind has conceived." (source: Huston Smith: Essays on World Religion. edited by M. Darrrol Bryant. Paragon House 1992 p. 135). "Access to the Vedas is the greatest privilege this century may claim over all previous centuries. Modern man is a diminished man. Despite the superficial excitements of our high-tech world, life for most has become a flat, stale, and joyless thing. It is joyless because we have forgotten what life is supposed to be. "The Vedas stand in all their might and majesty as the very source and bedrock of Hindu civilization. The Vedas are the inspired utterances of a whole galaxy of realized souls, of spiritual geniuses, of people not merely well versed intellectually but with spiritual enlightenment. " (source: Essays on Hinduism - By Karan Singh p. 50. For more on nature refer to chapter on Nature Worship). "The Vedas represent the pinnacle of the oldest literature of India. It is the ancient most written document of Indo-European language. This may be termed the principle source of religious thought." "The Vedas are the oldest scriptures in the world. The Vedas accept the existence of God. They say that the creator of this animate and inanimate world is God. The sun, moon, heavens and earth have been created by God only." (source: The Essence of the Vedas - By Dr. Mahendra Mittal p. 12). "They are the oldest classics and the most precious treasures of India. The soul of Bharatiya sanskriti dwells in the Vedas. The entire world admits the importance of the Vedas." (source: Vedas, soul of India - By Dina Nath Mishra - dailypioneer.com). Refer to Internet Sacred Texts on Hinduism and Stotra Rathnas. Refer to Battlestar Galactica - wikipedia.org. Refer to Rig Veda among 38 new heritage items in UNESCO culture list - Thirty manuscripts of the ancient Hindu text Rig Veda dating from 1800 to 1500 BC are among 38 new items that have been added to the United Nations heritage list to help preserve them for posterity.
" It has been the solace of my life -- it will be the solace of my death." "They haunt me. In them I have found eternal compensation, unfathomable power, unbroken peace." "The Upanishads contain such godlike fullness of wisdom on all things that I feel the authors must have looked with calm remembrance back through a thousand passionate lives, full of feverish strife for and with shadows, ere they could have written with such certainty of things which the soul feels to be sure." "Whatever may be the discoveries of the scientific mind, none can dispute the eternal truths propounded by the Upanishads." Huston Smith (1919 - ) born in China to Methodist missionaries, a philosopher, most eloquent writer, world-famous religion scholar who practices Hatha Yoga. "When I read the Upanishads, I found a profundity of world view that made my Christianity seem like third grade." Mahatma Gandhi (1869-1948) was among India's most fervent nationalists and he paid tribute to the remarkable Isha Upanishad. Covet nothing. All belongs to the Lord." - Isha Upanishad 1 -1 . (For more refer to chapter on and Quotes). India's soul-offering is the perennial light of the Upanishads. Upanishads are the divine revelations received by ancient seers. They represent the essence of the Vedas, the greatest truths ever known to mankind. The Upanishads are humanity's most profound philosophical inquiry and the first perceptions of the unity of all, the oneness of man and God. The Upanishads are also called the Vedanta. The literal meaning of Vedanta is 'the end of the Vedas.' They were composed around 700 BCE. The basic teaching of the Upanishads is that the essence of all beings - from a blade of grass to the perfect human being - and all things is the Divine Spirit, called Brahman. Free from theology and dogma, the Upanishads remain the primary source of inspiration and guidance for millions of Hindus and non-Hindus alike. They have influenced many Western thinkers, including von Gothe, Arthur Schopenhauer, Ralph Waldo Emerson. The Upanishads are the concluding portions of the Vedas and the teachings based on them is called Vedanta. The Upanishads focus on philosophical questions such as the purpose of life, origin of the universe, concepts of time, space and matter, as well as concepts of atman, Brahman, maya, immortality, rebirth, karma, and the world. The Upanishads offer to the world at large the supreme achievement of the awakened and illumined Hindu life. The Vedas represent the cow. The Upanishads represent milk. We need the cow to give us milk, and we need milk to nourish us. According to our Indian tradition, there were once 1,180 Upanishads. Of the 108 Upanishads that have been preserved, the following thirteen are generally considered to be the principal Upanishads: The Isa, Katha, Kena, Prasna, Mundaka, Mandhukya, Chandogya, Brhadaranyaka, Taittiriya, Aitareya, Svetasvatara, Kaivalya and Maitri. The Upanishads are known as the Vedanta, both because chronologically they come at the end of the Vedas and also because philosophically they represent the noblest upshot, the highest watermark of the Vedic civilization and genius. One meaning of the word Upanishad is to sit nearby. In the Indian tradition, the guru would be seated under a tree, near a river or lake, and one or more disciples would cluster around him to learnt he wisdom. They are the dialogues between guru and sisya. The Upanishads are the remarkable compositions, which contain sublime and philosophical speculations concerning the Universal Soul, the All-pervading Breath. The Upanishads contain the quintessence of Brahmavidya and declare that Brahman is in its nature Satchitananda and is also the material cause (Upadana Karana) and the efficient cause (Nimitta Karana) of the universe. The Upanishads declare that Karmas give us only perishable fruits and that jnana (knowledge) alone can lead to immortality. We begin with the Doctrine of a Universal Soul, an all-pervading Breath which is the keystone of the philosophy and thought of the Upanishads. This idea is somewhat different from monotheism as it has been generally understood in later days. For monotheism generally recognizes a God and Creator as distinct from the created beings; but the monotheism of the Upanishads, which has been the monotheism of the Hindu religion ever since, recognizes God as the Universal Being: - all things else have emanated from him, are a part of Him, and will mingle in him, and have no separate existence. This is the lesson which Yajnavalkya imparted to his esteemed wife Maitreyi. This too is the great idea which is taught in the Upanishads in a hundred similies and stories and beautiful legends, which impart to the Upanishads their value in the literature of the world. "All this is Brahman (the Universal Being). Let a man meditate on the visible world as beginning, ending, and breathing in the Brahman." "He is my self within the heart, smaller than a corn of rice, smaller than a corn of barley, smaller than a mustard seed, smaller than a canary seed or the kernel of a canary seed. He also is my self within the heart, greater than the earth, greater than the sky, greater than heaven, greater than all these worlds." Such is the sublime language in which the ancient Hindus expressed their sublime conception of the minute but all-pervading and Universal Being whom they called Brahman or God. "He who beholds all beings in the Self, and Self in all beings, he never turns away from it." (source: The Early Hindu Civilization - By Romesh Chunder Dutt p. 17-177). Etymologically the word Upanishad suggests “sitting down near”: that is, at the feet of an illumined teacher in an intimate session of spiritual instruction, as aspirants still do in India today. The sages who gave them to us did not care to leave their names; the truths they set down were eternal, and the identity of those who arranged the words irrelevant. While the Vedas look outward in reverence and awe of the phenomenal world, the Upanishads look inward, finding the powers of nature only an expression of the more awe-inspiring powers of human consciousness. The Upanishads tell us that there is a Reality underlying life which rituals cannot reach, next to which the things we see and touch in everyday life are shadows. They teach that this Reality is the essence of every created thing, and the same Reality is our real Self so that each of us is one with the power that created and sustains the universe. The Upanishads are not philosophy but are darshanas, “something seen” and therefore to be realized. This fervent desire to know is the motivation behind all science, so we should not be surprised to find in Vedic India the beginnings of a potent scientific tradition. By the common era, it would be in full flower…But the roots of this scientific spirit are in the Vedas. The Vedic hymns are steeped in the conviction of rita, an order that pervades creation and is reflected in each part – a oneness to which all diversity can be referred. From this conviction follows a highly sophisticated notion: a law of nature must apply uniformly and universally. The forest civilization of the Upanishads took a turn unparalleled in the history of science. It focused on the medium of knowing: the mind. The Self is the Brahman – is the central discovery of the Upanishads. Its most famous formulation is one of the mahavakyas or “great formulae”: Tat tvam asi, “You are That”. (source: The Upanishads: Translated for the Modern Reader - By Eknath Easwaran p. 1 - 25). Tat twam asi - That Thou art. What does it mean? It means that you are none other than God. Who else is God, if not you? "As flowing rivers disappear into the sea, losing their name and form, thus a wise man, freed from name and form, goes to the divine person who is beyond all." - Mundaka Upanishad iii 2. "Where is the life we have lost in living"
One of the lessons of the Upanishads is that you must regard "the universe as a thought in the mind of the Creator, thereby reducing all discussions of material creation to futility." The Upanishads teach that both space and time are endless or infinite. Modern science completely agrees. (source: India's Priceless Heritage - By Nani Palkhivala published by Bharati Vidya Bhavan 1980 p. 6-27). "All my attempts to adopt the theoretical foundation of physics to this (new type of) knowledge failed completely. It was as if the ground had been pulled out from under one with no firm foundation to be seen anywhere, upon which one could have built." How would one teach it?" (source: India's Priceless Heritage - By Nani Palkhivala published by Bharati Vidya Bhavan 1980. p.14-15). Of all the productions of the Epic age, however, the Upanishads are the most striking. They represent the belief of the learned and the wise, and they embody the philosophy and spiritual knowledge of the age. The Upanishads elucidate the doctrine of the Universal Soul. In India the Upanishads are classed as works which impart True knowledge, while the Brahmanas regulate Observances. This distinction has endured in India in all times. "So much for the man who desires, But for the man who does not desire, who not desiring, free from desires, satisfied in his desires, desires the Soul only, his spirit does not depart elsewhere; being Brahma, he goes to Brahma." 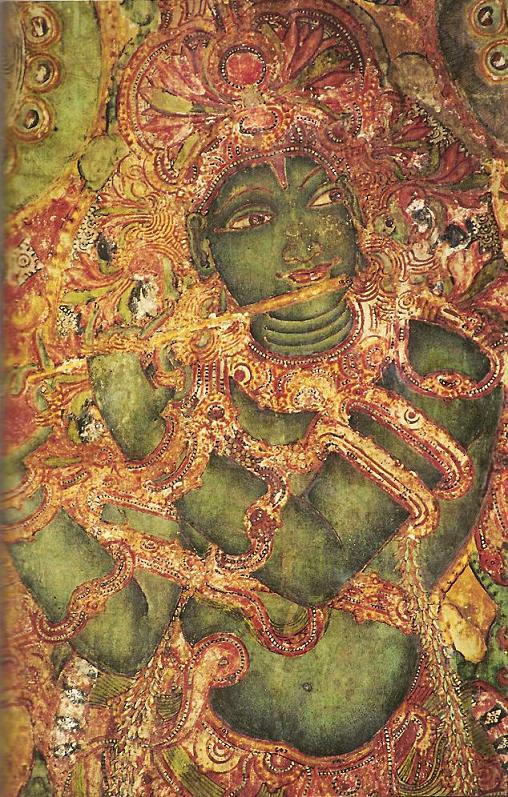 (Brihadaranyaka, iv. 4). This is true philosophical Hinduism as it was more than three thousand years ago, and as it is now. The doctrine is that all universe and all being proceed from Brahman, live in Him, are a part of Him, and end in Him. Each individual Soul has its beginning in the Universal Soul, and passes through a number of outward shapes or incarnations according to its doings in the world, and in the end merge in Him. The great idea of a true Unity comprehending all changing phenomena, is conceived and explained in the Hindu doctrine of Transmigration of Soul and of a Universal Soul. Handwritten page of Sanskrit text from the Chandogya Upanishad. Chandogya is one of the oldest and best known for its equation of the atman (soul) within, with the Brahman (absolute spirit) without. To download Hindu Scriptures - refer to Hindu Temple of Greater Cincinnati. Dama, Dana and Daya (i.e DA, DA, DA). In our daily life Indian culture has emphasized three cardinal virtues. There is a parable in the Brihadaranyka Upanishad 5.2 Prajapati, the ancestor of man, blessed his creation with a code of conduct consisting of three basic principles. viz. Dama, Dana and Daya i.e. restraint, charity and compassion. These are the basic qualities for which man is revered and respected in India. (source: Cultural Heritage of Ancient India - By Sachindra Kumar Maity p. 14). "Like corn decays the mortal," said the Katha Upanishad, "like corn is he born again." It is one of the fundamental tenets of Hinduism that the soul, upon the death of one body, moves to another body or form carrying with it all the impressions or deeds that it has accumulated in its previous body. It is a simple cause and effect process between the matter and the spirit, the soul. All living beings are subject to this process of transmigration since they began life. Professor F. W. Thomas in The Legacy of India says: "What gives to the Upanishads their unique quality and unfailing human appeal is an earnest sincerity of tone, as of friends conferring upon matters of deep concern." "The spacious imagination, the majestic sweep of thought, and the almost reckless spirit of exploration with which, urged by the compelling thirst for truth, the Upanishad teachers and pupils dig into the "open secret" of the universe, make this most ancient of the world's holy books still the most modern and most satisfying." (source: The Discovery of India - By Jawaharlal Nehru Oxford University Press. 1995 p. 90). The main teachings of the Upanishads are of a sublime character. Max Muller wrote: "How entirely does the Upanishads breathe throughout the holy spirit of the Vedas! How is every one who has become familiar with that incomparable book stirred by that spirit to the very depth of his soul! Vedanta is the most sublime of all philosophies and the most comforting of all religions." "On the tree of Indian wisdom there is no fairer flower than the Upanishads and no finer fruit than the Vedanta philosophy." In his Philosophy of the Upanishads, Deussen claims for its fundamental thought "an inestimable value for the whole race of mankind." It is in "marvelous agreement with the philosophy founded by Kant, and adopted and perfected by his great successor, Schopenhauer," differing from it, where it does differ, only to excel. (source: Hindu Superiority - By Har Bilas Sarda p. 298-299). Victor Cousin (1792-1867) French Philosopher, says: "The history of Indian philosophy is the abridged history of the philosophy of the world." (source: Hindu Culture and The Modern Age - By Dewan Bahadur K.S. Ramaswami Shastri - Annamalai University 1956 p.214-215). Lord Mountstuart Elphinstone (1779-1859) in comparing the ancient Greeks with the ancient Hindus, says: "Their (Hindus) general learning was more considerable; and in the knowledge of the being and nature of God, they were already in possession of a light which was but faintly perceived even by the loftiest intellects in the best days of Athens." (source: Hindu Superiority - By Har Bilas Sarda p. 299). - Lord Krishna (Bhagawad Gita, sloka 20, Chapter 10). "In the morning I bathe my intellect in the stupendous and cosmogonal philosophy of the Bhagavat Geeta, since whose composition years of the gods have elapsed, and in comparison with which our modern world and its literature seem puny and trivial." "One sentence of the Gita, is worth the State of Massachusetts many times over"
Ralph Waldo Emerson (1803-1882) an author, essayist, lecturer, philosopher, Unitarian minister who lectured on theology at Harvard University. He wrote: "I owed a magnificent day to the Bhagavad-Gita. It was as if an empire spoke to us, nothing small or unworthy, but large, serene, consistent, the voice of an old intelligence which in another age and climate had pondered and thus disposed of the same questions which exercise us." Julius Robert Oppenheimer (1904-1967) A theoretical physicist and the Supervising Scientist for the Manhattan Project, the developer of the atomic bomb. Oppenheimer acquired a deeper knowledge of the Bhagavad Gita in 1933 when, as a young professor of physics, he studied Sanskrit with Professor Arthur W Ryder (1877-1938) at Berkeley. Oppenheimer who finally brought the Gita into the popular vocabulary of the scientists in the West by citing this quote from the Bhagavad Gita. "If the radiance of a thousand suns were to burst at once into the sky, that would be like the splendor of the mighty one " and "Now I am become. Death, the destroyer of worlds." (July 16, 1945, inscription at first nuclear test site Trinity, New Mexico). Carl Sagan famous astro-physicist was awed by the revelation in the Gita that the creation and destruction, an essential part of the cosmic evolution, was actually postulated in a more realistic vast time scale. (source: Science and the Gita - By Dr. Alok K. Bohara). 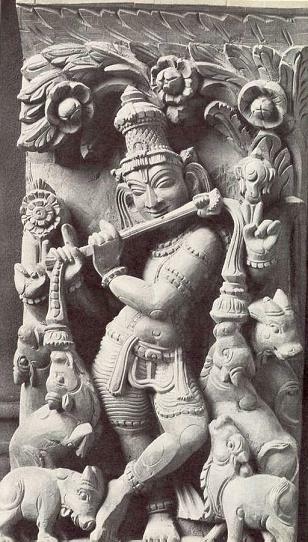 Lord Krishna playing the flute adorns a mural at Mattancherry Palace, Cochin, Kerala. The notes of Krishna's flute drifting through the woods are the call of the Divine. (image source: National Geographic - January 2008). Sri Aurobindo (1872-1950) most original philosopher of modern India observed: "The Bhagavad-Gita is a true scripture of the human race a living creation rather than a book, with a new message for every age and a new meaning for every civilization." He wrote in Essays on the Gita, "The Gita is the greatest gospel of spiritual works ever yet given to the race." "Such then is the divine Teacher of the Gita, the eternal Avatar, the Divine who has descended into human consciousness, the Lord seated within the heart of all beings, He who guides from behind the veil all our thoughts and action." Lokmanya Tilak (1856-1920) freedom fighter, great Sanskrit scholar and astronomer and author of Geeta Rahasya says: "It gives peace to afflicted souls, it makes us masters of spiritual wisdom." Warren Hastings (1754-1826), was the first governor general of British India wrote: "The Bhagavad Gita is the gain of humanity - a performance of great originality, of a sublimity of conception, reasoning and diction almost unequalled." Rudolph Steiner (1861-1925) Austrian-born scientist, editor, and founder of anthroposophy, wrote: "In order to approach a creation as sublime as the Bhagavad-Gita with full understanding it is necessary to attune our soul to it." Arthur Anthony Macdonell (1854-1930) in his History of Sanskrit Literature remarks: "The beauty and the power of the language in which this doctrine - that the zealous performance of duty is a man's most important task, to whatever caste he may belong - is inculcated, is unsurpassed in any other work of Indian literature." Lord Mountstuart Elphinstone (1779-1859) says: "The Bhagawat Gita deserves high praise for the skill with which it is adapted to the general Epic, and the tenderness and elegance of the narrative by means of which it is introduced." Mrs. Manning wrote: "Bhagwat Gita is one of the most remarkable compositions in the Sanskrit language." Count Maurice Maeterlinck (1862-1949) was a Belgian writer of poetry and a wide variety of essays. He won the 1911 Nobel Prize for literature. In his book The Great Secret calls The Bhagavad Gita "a magnificent flower of Hindu mysticism." Amos Bronson Alcott (1799-1888) writer, philosopher, schoolteacher, visionary. On May 10, 17, and 19' 1846, he wrote in his journal: "I read more of the Bhagavad Gita and felt how surpassingly fine were the sentiments." "The most beautiful, perhaps the only true philosophical song existing in any known tongue ....perhaps the deepest and loftiest thing the world has to show." Aldous Huxley (1894-1963) the English novelist and essayist wrote: "The Bhagavad-Gita is the most systematic statement of spiritual evolution of endowing value to mankind. The Gita is one of the clearest and most comprehensive summaries of the spiritual thoughts ever to have been made." (For more refer to chapter on and Quotes and GlimpsesX). "Inspired by the Bhagavad Gita and encouraged by the scientific evidence behind the power of meditation within the controlled environment, Dr. David J. Haglin has initiated a project in India involving mass meditation. He hopes to change group behavior to promote peace through such concentrated meditative contemplation. The power of intention through contemplation to alter personal disposition is amply articulated in the Gita as well, and scientists have just begun to scratch its surface. Interestingly, many Hindu scriptures speak of highly accomplished Rishis as having power to calm the other beings around them. But, there is much to learn about the relationship between the mind and matter. Nevertheless, efforts are underway to make good use of such potentiality." The Gita opens magnificently: the two armies arrayed, ready to do battle, on the ancestral field of Kuru; pennons flapping in the breeze and horses pawing the ground impatiently. As the conch shell signal the beginning of the battle, and as the armies are about to hurl themselves upon each other, Arjuna has doubts about the bloody deeds he is on the verge of perpetrating - the slaying of his kinsman, teachers, friends - and he voices his doubts to his charioteer, none other than the Lord Krsna himself. Krsna (Vishnu) then tells Arjuna why he must take part in the upcoming battle, why he has in reality, no alternative but to do so (his dharma, his duty as a Kshatriya), Krsna then preceeds to expound the unique philosophy of the Bhagavad Gita, including the essence of practical morality. (source: Traditional India - edited by O. L. Chavarria-Aguilar Prentice Hall Place of Publication 1964. chapter on Practical Morality - By Franklin Edgerton p. 69). Lord Krsna expounds the unique philosophy of the Bhagavad Gita. The Gita is a diamond among scriptures. The Bhagavad Gita embodies a universal ideal of spiritual warriorship, teaching that freedom lies not in renunciation or retreat, but in disciplined action performed with self-knowledge and detachment. Before the final battle of Kurukshetra, Arjuna had doubts whether it is right to fight and kill men who are his relations and his old friends; above all is war justifiable? Lord Krishna, after failing to convince him that it is the duty of a warrior to fight in a righteous war, reveals himself to Arjuna and answers his questions on the nature of the universe, the way to God and the meaning of duty. This magnificent dialogue between man (Arjuna) and creator (Krishna) forms the Bhagvad Gita, in which the Hindu doctrine is fully explained. (Note: Lord Krishna was born at midnight on Friday July 27, 3112 BCE. This date and time has been calculated by astronomers on the basis of the planetary positions on that day recorded by Sage Vyasa. Lord Krishna passed away on 3102 BC, start of Kail Yuga. The Bhagavad Gita was compiled around 500 BCE. The Gita does not solve the problem of war: rather it thrusts us right into the heart of the problem of war, any struggle, and shows us by means of one example how easily in actual life we can be drawn into tricky situations and conflicts of conscience the likes of which hardly arise for the ascetics in forests and caves. Lord Krishna, in the Gita is not addressing a sannyasin (a monk; one who has completely renounced worldly life), but a member of the warrior caste who still finds himself right in the midst of life. There are no cheap attempts at painting black and white in the Gita; no heroes in the service of the good cause and bad guys in the service of the devil and the ending a triumphant victory of good over evil. A certain dualistic pattern is evident in Krishna's pronouncements, the kind we find in almost all religions; the struggle of light against darkness, against asuric (demonic) forces. He says himself that he manifests himself a new in every age "whenever there is a decline of dharma....for the protection of the good...for the destruction of the wicked.." (IV. 6 -8). Good and bad are both aspects of the one divine reality. Good and evil are relative. The world is not neatly divided here in two halves. It is shown in all its ambiguity in its condition as maya, where all good contain a little evil and all darkness a little light. We will use only soul-force and never destroy by war or any even defensive employment of physical violence ? Good, though until soul-force is effective, the Asuric force in men and nations tramples down, breaks, slaughters, burns, pollutes, as we see it doing today, but then at its ease and unhindered, and you have perhaps caused as much destruction of life by your abstinence as others by resort to violence. Strength founded on the Truth and the dharmic use of force are thus the Gita’s answer to pacifism and non-violence. Rooted in the ancient Indian genius, this third way can only be practised by those who have risen above egoism, above asuric ambition or greed. The Gita certainly does not advocate war ; what it advocates is the active and selfless defence of dharma. If sincerely followed, its teaching could have altered the course of human history. It can yet alter the course of Indian history." The Gita is, in Sri Aurobindo’s words, “our chief national heritage, our hope for the future." (source: The Gita in Today’s World - by Michel Danino - bharatvani.org). Also refer to Gita Supersite and Stotra Rathnas. Arjuna was confused by noble thoughts before the war. But fortunately Lord Krishna labored through 18 long chapters of discourse in Bhagvad Gita to clear Arjuna's confusion and to help him take a decision. Arjuna finally decided to wage the war. But what today's intellectuals have failed to fathom is that only wars waged out of ambition, like Emperor Ashoka did, are wrong. Men of wisdom have regarded war as sometimes essential to bring peace. What is wrong is war of hate. Kill therefore with the sword of wisdom the doubts born of the ignorance that lies in thy heart. Be one in self-harmony, in Yoga and arise, great warrior, arise. The basis of Krishna's spiritual instruction, as of all Hinduism is the idea that the multitude of things and events around us are but different manifestations of the same ultimate reality. This reality, called Brahman, is the unifying concept that gives Hinduism its essentially monistic character in spite of the worship of numerous gods and goddesses. " Non-violence is the ideal for the individual, but society needs protection and cannot remain non-violent in the face of aggression. 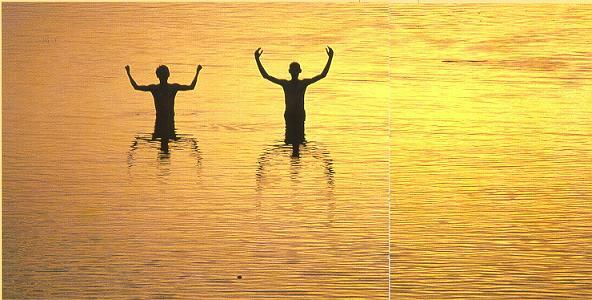 The Gita mentions repeatedly that ahimsa, or non-violence, is the highest virtue. The Bhagavad Gita forms a part of the great epic, the Mahabharata. It is the song of the Supreme God and is considered a sacred text of religion. Gita is said to be the most beautiful philosophical song in any language.The contents of the text are brought out in the form of a dialogue between Krsna, and Arjuna, a warrior prince of the Kuru dynasty. The situation in which both are placed in a battlefield where in Arjuna has come to fight, by force of circumstances, his own cousins, nephews, elders of the family, teachers and friends. Metaphorically, the battle and battlefield is life itself. For in life we are constantly engaged in a struggle both within and without between the forces of good and evil. The Bhagavad Gita is both supremely realistic and extremely idealistic, certainly the most acute, penetrating depiction of human nature and true morality, however remote it may seem from our own. Lord Krishna symbolizes the principle of Divine Incarnation (avatar), the supreme spirit become flesh, pouring into the world during the evil phases of the cosmic cycle in order to check evil - but in a spirit of complete detachment and indifference. The supreme thought of the Gita is concerned with a tolerance: "Whatsoever devotee seeks to worship whatsoever divine form (rupa) with fervent faith, I, verily, make that faith of his unwavering." Dharma and Non-Attachment: The first answer given to Arjuna is that he must full fill his Dharma, that is the basic obligation of his state in life. Only in this way can his salvation be achieved. He is a warrior. To abandon the field is to betray his fundamental duty. Yet if Dharma is to be fulfilled, it must be done with total self-detachment. There must be no seeking after success in life, for the fruit of action (karma phala). Action are to be done, because they are correct, because they are required by Dharma, not for personal gain. Lord Krishna’s views on the immortality of the soul were compiled in one of India’s holiest books of scriptures, the Bhagwad Gita. One reason that the Gita is a source of inspiration is because it presents to its readers the concept of God as personal (Isvara), and this is the most meaningful concept of God. A personal God is a being who knows every sorrow and is a witness of all our grief: "I am time never ending. I am the creator who sees all." Ishavara, the personal God, accepts us as we are and purifies us: " Though a man be soiled with the sins of a lifetime, let him but love me, rightly resolved, in utter devotion. I see no sinner. That man is holy. He shall not perish." In Chapter 11, perhaps the most famous in the Gita, Lord Krishna appears again before Arjuna in his full and this time awe-inspiring majesty. To enable him to see his far-flung powers he lends Arjuna the Celestial Eye. What follows is the sheer endless profusion of images of the mysterium tremendum et fascinosum, causing the amazed and frightened Arjuna's hair to stand on end. that would be like the splendor of the Mighty One." "I am mighty world-destroying Time, now engaged here in slaying these men. even without you, all these warriors standing arrayed in the opposing armies shall not live." - Bhagavad Gita chapter XI. 12- 32). Lord Krishna appears again before Arjuna in his full and this time awe-inspiring majesty. The Bhagavad Gita is the greatest testament of the Eternal Religion (Sanatana Dharma), the name by which the Hindus call their spiritual tradition. In it, spiritual wisdom finds its most profound, catholic, clear and modern expression. Gita means a song, and Bhagavad Gita means the divine song. The truth of scripture or of science does not depend on historical facts. The Gita is a sermon on the battlefield. It was delivered by Lord Krishna, the Divine Teacher, to Arjuna, his disciple, on the eve of a great battle between two sets of opposing cousins in which were engaged most of the princes and noblemen of India of the time. Krishna's sermon epitomizes the wisdom of Sanatana Dharma. It is a marvel because such an excellent work on religion and ethics has not been written since, nor is it likely to be written again. The Bhagavad Gita has been read daily and recited by millions in India over centuries and across its vast expanse. It has been the source of inspiration to individuals, to seekers of enlightenment and peace and also to leaders of great social and political movements. Gandhi had turned to the Gita for light and guidance in times of crisis just as a child in trouble turns to its mother for comfort and reassurance. Gita has inspired many thoughtful men of letters and theologians of the West; several influential and liberal movements like Christian Science and New England Transcendentalism owe their origin to it. The source of Emerson's inspiration was the Gita. Carlyle presented him with a copy of the Gita, and this little book was responsible for the Concord Movement. "All the broad movements in America," said Swami Vivekanada, "in one way or the other are indebted to the Concord Party." The Gita is a diamond among scriptures. Invocatory poems praise it as the essence of all scriptures. Krishna declares that God dwelling in the heart of all beings moves them to action. The Gita proclaims that there are many ways (yogas) of reaching the spiritual goal of life and that one should never disturb the faith of others whose understanding is poor. All the different ways of knowing God have been classified into four broad paths; namely 1. Jnana yoga - the way of wisdom, 2. bhakti yoga, the way of love of God 3. karma yoga, the way of selfless action 4. dhyana yoga, the way of meditation. (source: The Bhagavad Gita: A Scripture for the Future - By Sachindra K. Majumdar p. 1-55). The Bhagavad Gita is the jewel of all Hindu religious writing. This sacred poem, which appears in the great Hindu epic, the Mahabharata, is the quintessence of the Upanishadic teachings. The chief doctrines of the Bhagavad Gita are in theism, its devotionalism, its doctrine of the divine appearance in human form as savior of man, and its teaching of divine grace. In the Bhagavad Gita is found the first clear statement of beatitude as a mutual indwelling of God in man and man in God: "They who with devotion worship me, they are in me and I in them." (IX 29). (source: Religions of India: Hinduism, Yoga, Buddhism - Thomas Berry p. 31-32). The Bhagavad Gita is a spiritual, much revered work that has served as an inspiration to all Hindus for thousands of years. Sri AdiSankara composed his commentary on the Gita in the 8th century, while Sant Dnyaneswar, one of the foremost religious figures of Maharashtra wrote his commentary on the Geeta; The Dnyaneswari in 13th century. The Dnyaneshwari has been an integral part of Maharashtra’s cultural and religious tradition ever since. He wrote in his preface: "This famous and marvelous Sanskrit poem occurs as an episode of the Mahabharata, in the sixth - or "Bhishma" - Parva of the great Hindu epic. It enjoys immense popularity and authority in India, where it is reckoned as one of the "Five Jewels" - pancharatnani - of Devanagari literature. In plain but noble language it unfolds a philosophical system which remains to this day the prevailing Brahmanic belief blending as it does the doctrine of Kapila, Patanjali, and the Vedas." (source: Eminent Orientalists: Indian European American - Asian Educational Services. p. 234-235). Refer to Internet Sacred Texts on Hinduism and Stotra Rathnas. Gita consists of the teaching given to the pupil Arjuna by Lord Shri Krishna on the battlefield of Kurukshetra when the pupil, at the critical moment when the war was about to commence, was in doubt as to whether he was to follow the promptings of his personal affection and reverence for those on the opposite side or follow the dictates of duty. In unequivocal terms the Lord asks Arjuna to fight the battle irrespective of his personal ties with persons on the other side. The occasion is utilized by the Lord to explain the whole purpose of Life, the meaning of all the world process and the place of man in the scheme of things. As the colophon at the end of every chapter puts it, the Gita is an Upanishad, it is a philosophical treatise. But it is something more than that. It is a code of conduct for man applicable to varying temperaments, various avocations and various levels of development. It is this aspect that makes for the unique place which the Gita has among the scriptures of the world. The Lord stresses throughout the central idea of all Indian philosophies, the Imminence of God and the interdependence of man - not only man, but of all beings. "The Lord dwelleth in the heart of all beings." 'Having pervaded this whole universe with one fragment of Myself, I remain." Everything in the universe partakes of one life; the wise man realizes that the outer differences are deceptive and illusionary, he looks beyond the veil and sees the common basis of all beings. The most important contribution of the Gita to the religious thought of India is the emphasis the Lord lays on action (karma) in Sanskrit. The attitude of escapism is severely condemned by the Lord. He says, "Nor can anyone, even for an instant, remain really action-less." What binds a man is not action but his attachment to the fruit of the action. And so the lord repeatedly enjoins activity without attachment to the fruit. Lord Krishna playing his flute awakens devotion in the hearts of Hindu devotees, because it reminds them of God calling the soul to eternal wakefulness in Him. Above all, Gita is a gospel of hope and optimism. Let no one despair. Weak as we are, full of faults as we are, we can all reach the goal. We are Divine in essence, our Divinity is only veiled; rend the veil and let the inner Divinity reveal itself. "Even if the most sinful worship Me, with undivided heart, he too must be accounted righteous, for he hath rightly resolved." The Lord further guarantees, "Speedily he becometh dutiful and goeth to eternal peace." In the words of the Gita, the divine manifestations come to restore Righteousness when it has been trampled under the foot by human selfishness and perversity. (source: Facets of Indian Culture - By R. Srinivasan p. 240-244). The theology of the Bhagavad Gita is attractive because it does not favor of any of the path. Whatever works for you is the truth, a pragmatic attitude which is Hinduism's great and old strength. The Gita is thus a product of mature Hinduism. The Gita boldly asserts that dharma is possible without renunciation, and many reformers have seized upon that to try and awaken Indians from a too comfortable 'spiritual' torpor. The atman is regarded as deathless in a famous verse and it also undergoes - rebirth. If you find the Lord who is Transcendant then you are saved from this futility of rebirth. This can be done by your own striving or by your devotion to the Lord , both of which will call forth His grace. Krishna's exhortation to fight may be likened to the motivation of many a soldier or Resistance fighter who took up arms because his country needed his participation in the fight for freedom. As a crowning touch - Krishna reveals his Cosmic Form to Arjuna in some of the most impressive poetry ever written by the hand of man. This poem has become the most important spiritual rite of passage of most Hindus, and is the most beloved of Hindu scriptures of educated India. The central gem in the Mahabharata is the Bhagavad Gita. The first call in it is the call to manly action. Sri Krishna then teaches Nishkama Karmayoga and Dhyanayoga and Bhaktiyoga and Jananayoga. Devotion to God is the vital element in all of them. The easiest and surest of all the paths is Bhakti for in it God comes to our aid and crowns our effort with success. In short, the Gita reconciles and synthesizes all the apparently irreconcilable schools of philosophic thought in India. The Gita is thus a world book, a book for all humanity in all times and climes. George Feuerstein says: "According to Hindu tradition the epic depicts the drama of the human soul and its eternal struggle between the divine and the demonic forces, between Good and Evil, Right and Wrong - Dharma and Adharma. The great figures of the epic are believed to represent particular aspects of the human being. So Bhima is identified with 'strength' Yuyudhana with 'success' Dhrtaketu with 'prosperity' Kasiraja with 'purity' and so on. With the exception of a few scholars, the dry, academically stilted approach of contemporary Indology, with little interest in the inner meaning of its subject matter, becomes significantly apparent in the Gita which brimming with significance." (source: Introduction to the Bhagavad Gita - By George Feuerstein p. 61-62). Throughout the past thousand years of the history of Hinduism, the popularity and authority of the Bhagavad Gita, the Song of the Lord, has been, and still is, unrivaled. Whoever reads it for the first time will be struck by the beauty and depth; countless Hindus know it by heart and quote it at many occasions as an expression of their faith and their own insights. Hans Torwesten (1944 - ) a native of Germany, studied art in Vienna and Indian philosophy, meditation, and yoga in England. A writer, lecturer, yoga teacher, and painter, he now lives in Austria. He writes: "For all its maturity and roundedness the Gita is no tired work of old age. It also goes far beyond mere artificial syncretism. If besides its well-roundedness it did not also possess freshness and youthful vigor, it would hardly still inspire us so much today....but indeed an organic whole the totally universal perspective of which have saved many a reader who chanced upon this little book from the narrow-mindedness and despair of an apparently meaningless life, luring him on toward the immeasurable expanse of the realm of the divine." (source: Vedanta: Heart of Hinduism - By Hans Torwesten p.77). Charles Wilkins made the Gita known to Europe through his English translation which appeared in 1785. Notwithstanding the critical approach of many Western Indologists, the Bhagavad Gita has become a favorite book of many Westerners. Wilhelm von Humboldt 1767- 1835) Prussian minister of education, a brilliant linguist and the founder of the science of general linguistics. He read this Latin version was so enthusiastic that he declared "this episode of the Mahabharata is the most beautiful, nay perhaps even the only true philosophical poem which we can find in all the literature known to us." The Gita is a book of crisis. A direct modern Western reference to the Bhagavad Gita occurred in a context that to call historical is almost an understatement - it may better be called apocalyptic. Julius Robert Oppenheimer (1904-1967) Scientist, philosopher, bohemian, and radical. A theoretical physicist and the Supervising Scientist for the Manhattan Project, the developer of the atomic bomb, described the thoughts that passed through his mind when he witnessed the first atomic test explosion in the desert of New Mexico: "On the sight of the fire-ball two ancient verses came to my mind. The one: "Of a thousand suns in the sky if suddenly should burst forth the light, it would be like unto the light of that Exalted One." (BG XI, 12). The other: "Death, am I, cause of destruction of the world, matured and set out to gather in the worlds there." (BG XI, 32). Henry David Thoreau (1817-1862), American Philosopher, Unitarian, social critic, transcendentalist and writer: "In the morning I bathe my intellect in the stupendous and cosmogonal philosophy of the Bhagavad Gita in comparison with which our modern world and its literature seems puny." Ralph Waldo Emerson (1803-1882) author, essayist, lecturer, philosopher, Unitarian minister said this about the Gita: "I owed a magnificent day to the Bhagavad-Gita. It was as if an empire spoke to us, nothing small or unworthy, but large, serene, consistent, the voice of an old intelligence which in another age and climate had pondered and thus disposed of the same questions which exercise us." (for more quotes refer to chapter on Quotes). Rabindranath Tagore (1861-1941) poet, author, philosopher, Nobel prize laureate, proclaimed: "It feels me with great joy and a high hope for the future of humanity when I realize that there was a time in the remote past when our poet, sages stood under the lavish sunshine of an Indian sky and greeted the world with the glad recognition of kindred. ...This is a noble heritage....it is not merely intellectual or emotional, it has an ethical basis, and it must be translated into action. Upanishads say, 'The supreme being is all pervading, therefore he is the innate good in all." (source: Indianization - By Paramesh Chowdhury Calcutta: Globe Library, 1981 p. 109). Herman Hesse (1877-1962) German poet and novelist, awarded the Nobel Prize for literature in 1946 says: "The marvel of the Bhagavad-Gita is its truly beautiful revelation of life's wisdom which enables philosophy to blossom into religion." Carl Jung (1875-1961), student of Sigmund Freud, psychiatrist think: "The idea that man is like unto an inverted tree seems to have been current in by gone ages. The link with Vedic conceptions is provided by Plato in his Timaeus in which it states..." behold we are not an earthly but a heavenly plant." W. L. Wilmhurst says that the Gita is: "the climax at once for the religion, the philosophy and the poetry of an eastern people." (source: Hindu Culture and The Modern Age - By Dewan Bahadur K. S. Ramaswami Sastri. p. 218-219). "For the protection of the good and the destruction of the wicked...I am born in every age." Dynamism is the great law of the universe. Change and movement occur eternally, symbolized by Shiva's Dance. The recurring theme in Hindu mythology is the creation of the world by the self-sacrifice of God - "sacrifice" in the original sense of "making sacred" - whereby God becomes the world. Lila, the play of God, is the creative activity of the Divine; and the world is the stage of the Divine play. Brahman is the great magician Who transforms Himself into the world and He performs this feat with His "magic creative power", which is the original meaning of maya in the Rig Veda. 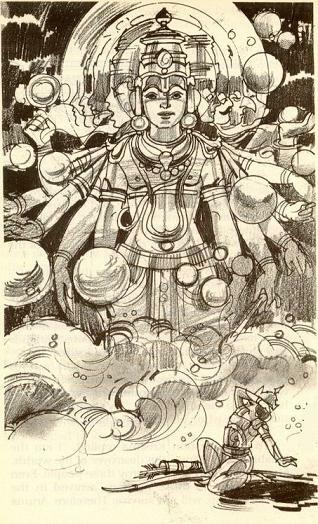 "As long as we confuse the myraid forms of the Divine lila with reality, without preceiving the unity of Brahman underlying all these forms, we are under the spell of maya...Maya is the illusion of taking these concepts for reality, of confusing the map with the territory." To the Rishis the divine play was the evolution of the cosmos through countless aeons. There is an infinite number of creations in an infinite universe. The Rishis gave the name kalpa to the unimaginable span of time between the beginning and the end of creation. They understood the staggering scale of the divine play. Many centuries later the scientific mind still boggles at the scale of creation which makes infinity intelligible. The Rishis clearly perceived that the most fundamental characteristic of this incomprehensible creation was that it was in a perpetual state of movement, flow and change. Lila is a rhythmic play which goes on in endless cycles, the One becoming the many and the many returning to the One. "At the end of the night of time all things return to my nature, and when the new day of time begins I bring them again into light. Thus through my nature I bring forth all creation and this rolls around in the circles of time." "But I am not bound by this vast work of creation. I am and I watch the drama of works. I watch and in its work of creation nature brings forth all that moves and moves not; and thus the revolutions of the world go round." How uncanny is the identity of the ancient insights with the latest conclusions of modern science which are well summed up in the fascinating book, The Tao of Physics by Fritjof Capra: "When we study the universe as a whole, with its millions of galaxies, we have reached the largest scale of space and time; and again, at that cosmic level, we discover that the universe is not static - it is expanding! Modern physics has come to the conclusion that mass is nothing but a form of energy. It would not be an exaggeration to say that the basis of the theory of relativity, and the space-time character of the universe, were perceived by the old Indian Rishis in their advanced stage of spiritual consciousness. In their state of higher consciousness they realized that the ultimate constituents of the universe - energy and mass, particle and wave, - were but different aspects of the same basic process, but the same Oneness which pervaded the entire universe. Today science has relearned that lesson. In the words of A. N. Whitehead: "Matter has been identified with energy, and energy is sheer activity." Thus, the vastest knowledge of today cannot transcend the buddhi of the Rishis; and science, in its most advanced stage, is closer to Vedanta than ever before. "All science is transcendental or else passes away. Botany is now acquiring the right theory - the avatars of Brahman will presently be the text-books of natural history." 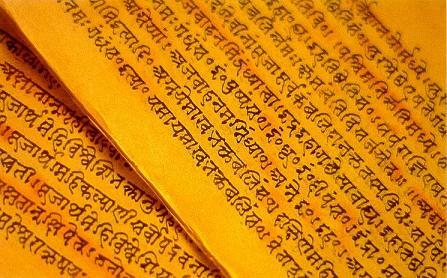 Sanskrit, the language of Hindu scriptures, is the oldest and the most systematic language in the world. It originated several thousand years ago, yet is still used in India. (image source: Eastern Wisdom: The Philosophies and Rituals of the East - By Michael Jordan p. 29). "Samvit or pure consciousness is one and non-dual, ever self-luminous, and does not rise or set in months and years and aeons, past or future." (source: India's Priceless Heritage - By Nani Palkhivala published by Bharati Vidya Bhavan 1980 p 8-11). "The ancient Vedantic concepts that we all cut our spiritual teeth on are a part of the grand reconciliation now going on between science and religion. We find these concepts embodied in the extensive literature starting with the four Vedas and their subsequent elaborations in the Upanishads. The recurring theme of these perceptions is that, underlying all physical reality, there is one abstract entity, Brahman, with the quality of consciousness. Having created the universe, Brahman remains present everywhere today, administering basic aspects of everything in our cosmos. Recent scientific discoveries seem to validate the concept of Brahman. Physicists and cosmologists are close to proving that there is one source behind the physical universe, and they call this source the unified field. In a profound sense, Brahman, the Vedantic concept and the unified field of physics appear to be synonymous." (source: Physics & Vedanta: So much in common - Mani Bhaumik Times of India 2/26/02). Refer to Internet Sacred Texts on Hinduism and Stotra Rathnas. An Epic is a long narrative poem. Its theme is grand and its style is in keeping with the grandeur of the theme. Kings, queens, nobles, courts, forests, seas and wars are all elaborately described. The two Indian epics - The Ramayana and Mahabharata have all these characteristics and present a picture of society of the period. Mahabharata is the longest poem written in any language of the world. The epics are literary compositions, describing in glorious terms the heroic deeds and virtues of the Kshatriya princes of ancient India. They are respected as sacred works and at the same time they tell us a lot about the society and the people. The Ramayana and Mahabharata have been a constant source of comfort, guidance, and entertainment to millions down the ages. Whereas the Homeric Epics have never been sacred books and have long since ceased to occupy a central position in Greek culture, the Indian Epics are the most widely read and respected religious books of the Hindus today. "It is notable that the two vast Indian epics have been considered as much as Dharma-shastras as great historico-myth epic narratives, itihasas. They are, that is to say, noble, vivid and puissant picture of life, but they utter and breathe throughout their course, the law and ideal of a great and high ethical and religious spirit of life and aim in their highest intention at the idea of the Divine and the say of the mounting soul in the action of the world." 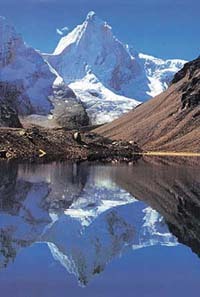 "Although the Hindus, like the Greeks, have only two great epic poems, namely, the Ramayana and the Mahabharata, yet to compare these with the Illiad or the Odyssey is to compare the Indus and the Ganga rising in the snows of the world's most colossal ranges, swollen by numerous tributaries, spreading into vast shallows or branching into deep divergent channels, with the streams of Attica or the mountainous torrents of Thessaly." He continues, "There are many graphical passages in the Ramayana and the Mahabharata which for beauty of description cannot be surpassed by anything in Homer. The diction in the Indian epics is more polished, regular and cultivated and the language is in an altogether advanced stage than that of Homer." (source: The Soul of India - By Satyavrata R Patel p. 82-83). Arnold Hermann Ludwig Heeren (1760-1842) in Historical Researches, says: "The literature of the Hindus is rich in epic poetry." Saint Hilaire Bartholemy thus speaks of the Mahabharata in the Journal Des Savantes of September 1886: "When a century ago (1785) Mr. Charles Wilkins published in Calcutta an extract from the grand poem (Mahabharata) and made it known through the episode of the Bhagavad gita, the world was dazzled with its magnificence. Vyasa, the reputed author of Mahabharata, appeared greater than Homer...It has not the less been admitted that this prodigious Hindu epic is one of the grandest monuments of its kind of human intelligence and genius." (source: Hindu Superiority - By Har Bilas Sarda p. 237). Francois Gautier (1950 - ) Paris-born, he has lived in India for 30 years, is a political analyst for Le Figaro, one of France's largest circulation newspaper has written that: "The Mahabharata and Ramayana are epical, in the spirit as well as the purpose. The Mahabharata is on a vast scale, maybe unsurpassed even today, the epic of the soul and tells a story of the ethics of India of that time, its social, political and cultural life." (source: A New History of India - By Francois Gautier p. 40 - 42). Itihasa, (history) is the collective term for the Ramayana and the Mahabharata, in the western publications usually called the Great Epics. The two great epics of India, Ramayana and Mahabharata, have inspired millions of devotees, down the more than thirty-odd centuries that they have been in existence. The two epics are truly the soul of ancient India and of Hindu society, even today. The Ramayana took place in the period (4750 BCE) and the Mahabharata War took place on November 22, 3067 BCE. This date has been calculated by astronomers on the basis of the planetary positions on that day as recorded by Vyasa. (For more information please refer to Dating Mahabharata War Two Eclipses in Thirteen Days) The immortal Bhagavad Gita is also enshrined in the Mahabharata. 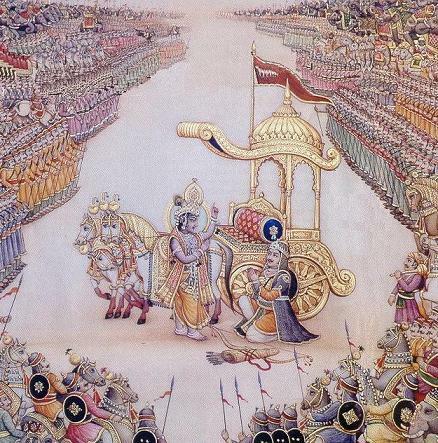 It is a discourse on Duty and Right Action given by Lord Krishna to Arjuna on the field of battle at Kurukshetra. An inspiration and guide to humanity in its conduct through life, the Bhagavad Gita has few parallels in the world. The greatest characters portrayed in these epics have become for all times the sources of inspiration and emulation for the members of the Hindu society and, indeed for all societies since their approach is human with no consideration of race or place. 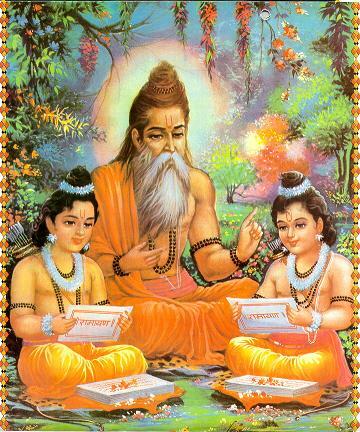 The authors of these epics - Rishi Valmiki and Rishi Vyasa were the greatest teachers of our thought in two different ages, who, through their creations, created ideal and practical human beings struggling to solve problems of their times, and for all times indeed, since those problems are universal. The Mahabharata contains the famous lecture known as Shrimad Bhagvadgita which infact, is the essence of the Hindu thought spoken through the mouth of Lord Krishna himself. 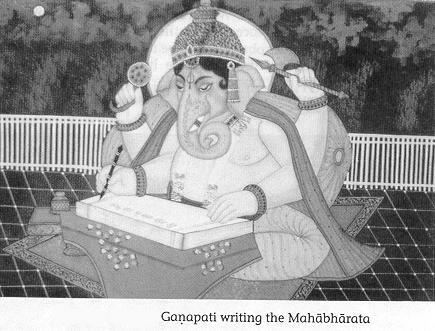 Rishi Vyasa dictating the Mahabharata to Ganesha. Lord Ganesha is also known as Shoden in Japan. 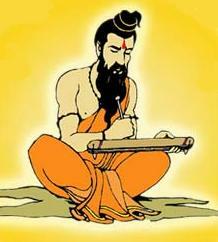 Tradition has it that Maharshi Vyasa, gave to the world the epic of Mahabharata. 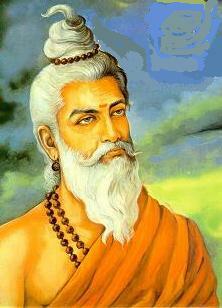 Vyasa is said to be an ancestor of the Kauravas and Pandavas. The story goes that, having resolved to write the Mahabharata, Vyasa meditated on Lord Brahma the Creator, who manifested himself before him. Vyasa with folded hands said: "Lord, I have decided to write the sacred story, but cannot think of anyone who can take it down to my dictation." Lord Brahma approved and said,"O sage, pray to Lord Ganapati and beg him to take it down for you." Saying which Brahma disappeared. The sage Vyasa prayed to god Ganapati who appeared before him. Vyasa received him with due respect and sought his aid: "Lord Ganapati, I shall dictate the story of Mahabharata and I pray you to be so gracious as to write it down." Ganapati replied, "Very well, I shall do as you wish. But my pen must not stop while I am writing, so you must dictate without pause or hesitation." Vyasa agreed, safeguarding himself, however, with a counter-condition: "Be it so, but you must first grasp the meaning of what I say before writing it down." Ganapati smiled and agreed to the condition. Then the sage began to sing the story of Mahabharata. He would occasionally compose some complex stanzas which would make Ganapati pause a while to get at their meaning, and Vyasa would avail of the interval to compose many more stanzas in his mind. Thus the Mahabharata came to be written to the dictation of Vyasa. 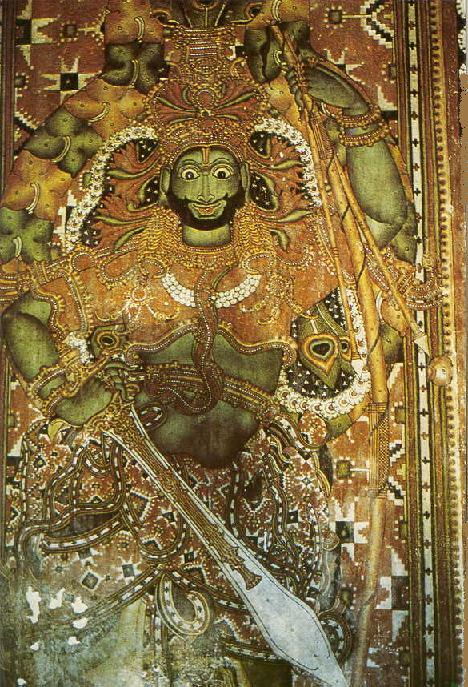 Lord Rama - 8th century, Kerala, India. 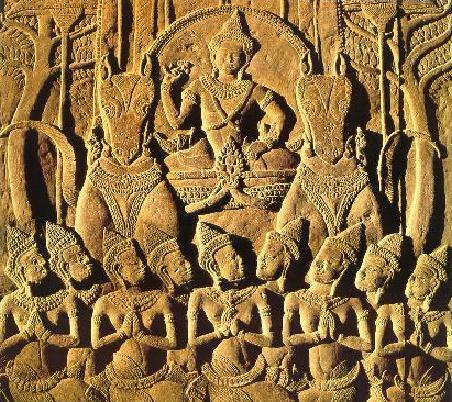 The Ramayana and Mahabharata are based on historical tradition (itihasa), considerably embellished, to be sure, but still with a kernel of historicity: we find depicted in these epics a highly developed civilization spanning millennia, and a Great War waged around 3100 B.C. both of which are incompatible with semi primitive cattle-worshipping Aryans coming into India. "There lies my great poem, as vast as the Indian ocean, blessed, gilded with the sun, the book of divine harmony wherein is no dissonance. A serene peace reigns there, and in the midst of conflict an infinite sweetness, a boundless fraternity, which spreads over all living things, an ocean (without bottom or bound) of love, of pity, of clemency." (source: Philosophy of Hinduism - An Introduction - By T. C. Galav ISBN: 0964237709 Universal Science-Religion. Pg 149). (source: The Soul of India - By Satyavrata R Patel p. 83).
" The Ramayana is a work of the same essential kind as the Mahabharata; it differs only by a greater simplicity of plan, a more delicate ideal temperament and a finer glow of poetic warmth and color. At the same time there is a like vastness of vision, an even more wide-winged flight of epic sublimity in the conception and sustained richness of minute execution in the detail. The poet makes us conscious of the immense forces that are behind our life and sets his action in a magnificent epic scenery, the great imperial city, the mountains and the ocean, the forest and wilderness, described with such a largeness as to make us feel as if the whole world were the scenes of his poem and its subject the whole divine and titanic possibility of man imaged in a few great or monstrous figure." (source: The Foundations of Indian Culture - By Sri Aurobindo p. 289 - 290). Sir Monier Williams says: "Ramayana is undoubtedly one of the greatest treasure in Sanskrit literature." Sir William Jones (1746-1794) wrote: "The Ramayana is an epic poem on the story of Rama, which, in unity of action, magnificence of imagery and elegance of style far surpasses the learned and elaborate work of Nonnus." Ralph T H Griffith (1826 -1906) author of The Hymns of Rig Veda, says: "Well may the Ramayana challenge the literature of every age and country to produce a poem that can boast of such perfect characters as a Rama and Sita." He adds, "Nowhere else are poetry and morality so charmingly united, each elevating the other as in this really holy poem." (source: Hindu Superiority - By Har Bilas Sarda p. 232 - 235). "It must be admitted, however, that, in exhibiting pictures of domestic life and manners, the Sanskrit epics are even more true and real than the Greek and Roman. In the delineation of women the Hindu poet thrown aside all exaggerated coloring and drawn from nature - Kaikeyi, Kausalya, Mandodari (favorite wife of Ravana), and even the humble-backed Manthara are all drawn to the very life. Sita, Draupadi, and Damayanti engage our affections and our interest for more than Helen or even Penelope. Indeed Hindu wives are generally perfect patterns of conjugal fidelity; can it be doubted that, in these delightful portraits of the Pativrata or purity and simplicity of Hindu domestic manners in early times." Hanuman', son of Vayu (God of Wind), a symbol of selfless service to God. It is no accident that a monkey should be accorded this honor: love transcends social standing or even race or species. The Ramayana is India's national epic. The future of her nationhood depend on how this epic lives in and through us. 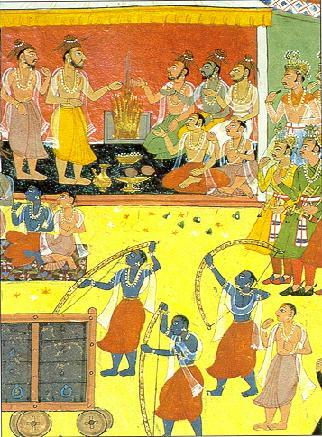 The Ramayana is composed by Valmiki in beautiful Sanskrit by assembling the elements of a long oral tradition. It tells of the infancy and youth of Rama, son of King Dasaratha, and of his marriage to Princess Sita, 'born from a furrow in the ground.' He won her, by bending a prodigious bow which his rivals could not even lift. Here is the struggle between Good and Evil. The jealously of his father's favorite wife brings about Rama's exile to the forest. Lakshmana and Sita are permitted to go with him. In the forest, Ravana kidnaps Sita by trickery and carries her off to his residence to Lanka. 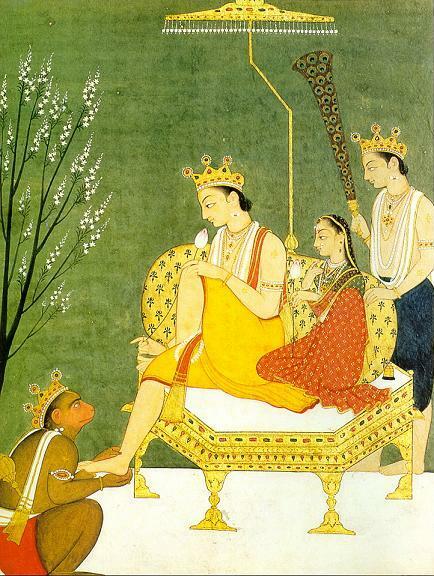 To deliver Sita, Rama becomes the ally of the 'army of monkeys' led by Hanuman. 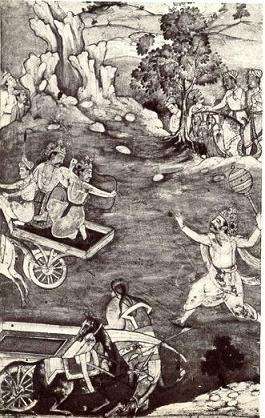 He kills Ravana and his exile ends, he returns triumphantly with Sita and Lakshman to Ayodhya. Ramayana, meaning 'Rama's travels' is one of the greatest epics of all time. Packed with action and romance, this more than 4,000 years old story of Rama's journey through India and his spiritual voyage as man and god is also a holy text by which millions of Hindus live their lives. "Indeed, in depicting scenes of domestic affection, and expressing those universal feelings and emotions which belong to human nature in all time and in all places, Sanskrit epic poetry is unrivalled even by Greek Epics.....In the Indian epics, such passages abound, and besides giving a very high idea of the purity and happiness of domestic life in ancient India, indicate a capacity in Hindu woman for the discharge of the most sacred and important social duties." "Yet there are not wanting indications in the Indian Epics of a higher degree of civilization than that represented in the Homeric poems. The battlefields of the Ramayana and Mahabharata,......are not made barbarously wanton cruelties; and the description of Ayodhya and Lanka imply far greater luxury and refinement than those of Sparta and Troy." "He (Rama) is the type of a perfect husband, son, and brother. Sita also rises in character far above Helen and even above Penelope, both in her sublime devotion and loyalty to her husband, and her indomitable patience and endurance under suffering and temptation.....it may be affirmed generally that the whole tone of the Ramayana is certainly above that of the Illiad." Lord Rama - the dark one with the bow. The Ramayana has enjoyed the most extraordinary circulation throughout India itself and the countries under Indian influence. The beautiful language and the poetry of the Ramayana would suffice to make it a favorite of the Indians; as well as this, they also admire Rama's obedience towards his father, his generosity towards Kaikeyi, Sita's fidelity in following Rama into the jungle and during her captivity. Bharata's and Laksmana's brotherly loyalty and the greatness and strength of Rama. If ever there was an ancient literary work that is alive in our time, it is the Ramayana.! It is read and sung every day by numberless Hindus, humble and high; it is worshipped and held sacred and performed in Rama-Lilas every year in small and big towns.
" Imagine a story that is the Odyssey, Aesop's fables, Romeo and Juliet, the Bible and Star Wars all at the same time. Imagine a story that combines adventure and aphorism, romance and religion, fantasy and philosophy. Imagine a story that makes young children marvel, burly men weep, and old women dream. Such a story exists in India, and it is called the Ramayana. This best beloved of Indian epics was sung by nameless bards for ages before being written down by Valmiki in the third century B.C. It chronicles Rama's physical voyage from one end of the Indian subcontinent to the other, and his spiritual voyage from Man to God. " (source: Arrow of the Blue-Skinned God: Retracing the Ramayana Through India - By Jonah Blank p. ix). The whole epic is a lesson in duty. This is as it should be: every man and every woman must follow dharma, too many people today forget this basic truth. Ramayana means Rama's travels. 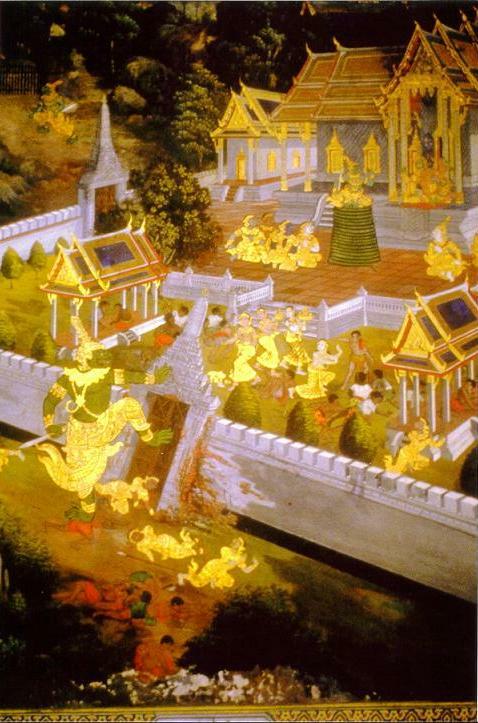 Since the time of Valmiki, other poets have made their translations and adaptations of this epic, and Ramayana long ago migrated across South East Asia (Suvarnabhumi) to countries as Thailand and Indonesia, each of whom have their own Ramayana literary traditions and have made it a part of their culture. In Thailand, Ramayana dance-drama is the national dance, an inheritance of the country ancient Hindu past, and the Thai king traditionally models himself on Rama. Indonesia is famous for its shadow puppet theatre depicting Ramayana. The Ramayana is shorter, more unified, more appealing and even more popular than the Mahabharata. In its present form it constitutes about one-quarter of the volume of the Mahabharata, about 24,000 shokas. As usual, good deal of textual criticism has been applied by Western scholars to this work. The traditional Indian view seems to emerge as historically substantially correct: before being reduced to writing, the story of Rama, the Prince of Ayodhya, was sung as a ballad by wandering bards in the assemblies of kings. The Ramayana itself says that the first recitation took place in the forest before a gathering of sages, the second in the streets of Ayodhya, and the third and final one in the palace of Rama, after his enthronement. In its numerous reworkings in the vernaculars the Ramayana has become an inspiration for millions of Hindus. 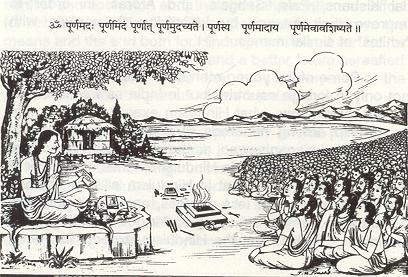 Mahatma Gandhi praised the Ramacaritamanasa of the 16th century poet Tulsidasa as the greatest work in the entire religious literature of the world; countless Indian villagers know a large number of its dohas, summarizing not only the story of Rama but also epigrammatically expressing the accumulated wisdom of India. Scholars have hailed it as the "perfect example of the perfect book." The Valmiki Ramayana, also called Adikavya or first epic poem. 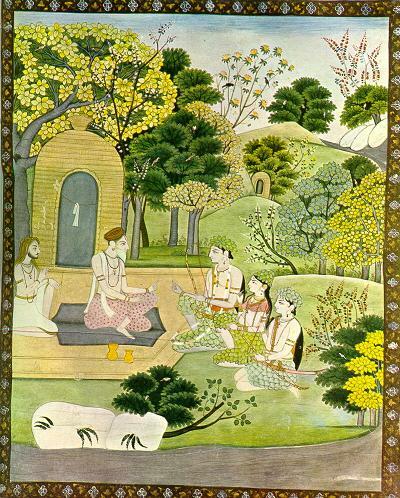 The Ramayana is believed to have been divinely revealed: The story is supposed to have come to its composer: Valmiki, while meditating upon the mantra "Ram" Legend has it that he retired to the forest where during 1,000 years of meditation, he kept so motionless that his body became covered by a valmiak (anthill) - hence his name, meaning "son of the anthill." "The Ramayana will be read in this country of Bharata as long as its rivers continue to flow and its mountains remain in their place" reads one verse, from the Ramayana. Today, Ramayana remains an essential part of Mother India and the name of Rama echoes on a million lips every day. In Indian villages it is customary to hear stories of Ramayana in the evening. After sunset villagers gather to hear the storyteller bring the characters to life; they cheer or cry as the story unfolds, then go home to sleep and dream of Ramayana. Scene from Thai Ramayana, Grand Palace, Bangkok. Thailand. 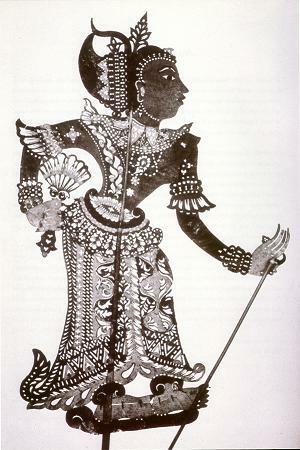 Sita Devi, a Malay shadow puppet. In India, the roots of this story go back, thousands of years. It has been told countless times, by Hindus, Jains and Buddhists, and early spread beyond India itself to the countries of South east Asia. Today, if you visit the Grand Palace in Bangkok, Thailand, you can see beautiful carvings around the walls, telling a Thai Buddhist version of the story. In villages in Indonesia and Malaysia, professional puppeteers and musicians still present the story thorough puppets or ordinary puppets, accompanied by the haunting music of the gamelan. (source: Sita's Story - By Jacqueline Suthren Hirst p. 6-9). The Web of Karma: One great theme of Ramayana is the working out of Karma, the consequence of past deeds. The basic plot of Ramayana is a simple struggle between good and evil. But it is not allowed to remain simple. 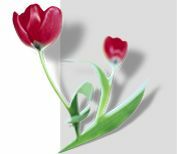 We discover that there are many layers of karma involved and dilemmas to be faced, and the gap between good and evil is not as clear as we might have thought, and that behind this simple story lies a cosmic purpose to be fulfilled. At every step along the way, we are tested emotionally and intellectually. Freedom and Duty: A central theme of Ramayana is the sacrifice of freedom for the sake of duty or honor. The Sanskrit word approximating "duty" is dharma which has no equivalent in English. Roughly translated it means, ' the essential purpose of life.' In Hindu society this manifests as a set of principles governing behavior, such as the duty to obey one's father or to protect one's dependents. In India, Ramayana passed into each of the regional languages, such as Assamese, Bengali, Hindi, Kashmiri, Oriya, Kannada, Telugu, Malalylam, where it generated separate literary and religious traditions. Each region of the country has its own style of Ramayana drama, such as the famous Kathakali dancer of Kerala, and elaborate dramatic productions are staged in the major cities. At festivals effigies of the demon character Ravana and Kumbhkarna are burnt. Ramayana is a staple of Indian cinema and the serialized Ramayana on television, broadcast for 78 weeks during 1987-88, brought the nation to a standstill for an hour each Sunday. In all these ways Rama has entered the subconscious of India. This is why, so long after its creation, Ramayana remains an essential part of Mother India and the name echoes on a million lips every day. (source: Ramayana - A Journey - By Ranchor Prime p. 6-14). Warrior Prince, The Legend of Ramayana - animated movie. The Ramayana describes the ideal man and the ideal woman and may be called the Epic of the Household. The sacrifice of one's personal welfare in the interests of the general welfare and the supremacy of Dharma are its primary lessons. Warrior Prince, The Legend of Ramayana was awarded the "Best Animation film of the year" out of 60 competing entries at the Santa Clarita International festival, in Santa Clarita, California. While accepting the award, Shah said, "This is not just an epic story set in India. It presents a code by which millions upon millions live their lives. No wonder George Lucas borrowed heavily from the epic and made a very universal film out it called Star Wars!" (For more information, please refer to Jedi in the Lotus - By Steven Rosen - Infinity Foundation). Warrior Prince is a 12 million-dollar film based upon on Ramayana. It is a 95-minute action packed, feature film that explores the animation style called "FUSION." which consists of 3 different schools of animation. The picture is a true blend of art, romance, music and stunning visual power of East and West melding--lifting the story out of it's historic setting and delivering it slap-bang it into 21th Century. The film was directed and conceived by Yugo Sako, a versatile documentary filmmaker from Japan. James Earl Jones is the narrator. Dr. Ramakrishna Gopal Bhandarkar (1837-1919) Eminent Orientalist, has rated the Mahabharata as "the greatest work of imagination that Asia has produced." Sir Charles Elliot (1862-1931) British diplomat and colonial administrator, has called it "a greater poem than the Iliad." (source: Story of Civilization: Our Oriental Heritage - By Will Durant MJF Books.1935 p. 561). "Borrowings by western scholars in the sphere of literature and philosophy are obvious and well-known. There are near virtual; copies of plots, characters, episodes, situations and time duration from the Mahabharata in Homer and Virgil." (source: Philosophy of Hinduism - An Introduction - By T. C. Galav p. 18). Arnold Hermann Ludwig Heeran (1760-1842) says: "It will scarcely be possible to deny the Mahabharata to be one of the richest compositions in Epic poetry that was ever produced." Alain Danielou (1907-1994), son of French aristocracy, author of numerous books on philosophy, religion, history and arts of India has said: "The Mahabharata is a mine of information about the science, customs, religion, and arts of India at various stages of its history. Additions from very different sources have been made to the original, turning it into a vast anthology of human knowledge. Sri Aurobindo (1872-1950) says: "The Mahabharata is not only the story of the Bharatas, the epic of an early event which had become a national tradition but on a vast scale the epic of the soul and religious and ethical mind and social and political ideas and culture and life of India. The Mahabharata is the creation and expression not of a single individual mind but on the mind of a nation; it is the poem of itself written by a whole people....A vast temple unfolding slowly its immense and complex ideas from chamber to chamber." (source: The Vision of India - By Sisirkumar Mitra p. 58 and The Foundations of Indian Culture - By Sri Aurobindo p. 42). "The Mahabharata is not only the largest, but also the grandest of all epics, as it contains throughout a lively teaching of morals under a glorious garment of poetry." (source: Hindu Superiority - By Har Bilas Sarda p. 236). 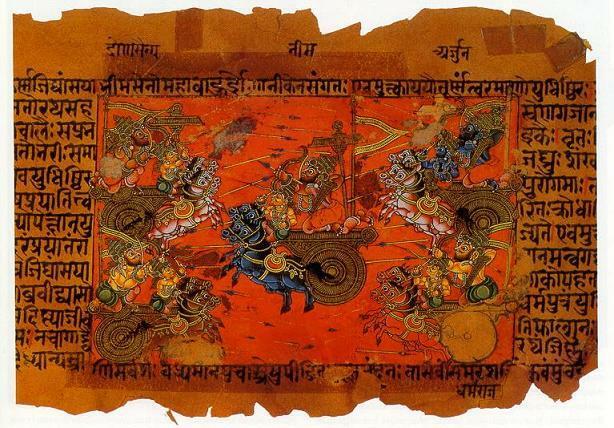 A manuscript illustration of the Battle of Kurukshetra, fought between the Kauravas and the Pandavas, recorded in the Mahabharata Epic. (image source: Eastern Wisdom: The Philosophies and Rituals of the East - By Michael Jordan p. 35). Narayana and Nara, the divine and the human their personal encounters and discussions of dharma, artha, kama and moksa, are to be found here. It is a veritable encyclopedia and it carries this verse about its own scope. It is said that what is found here may be found elsewhere but what is not found here cannot be found elsewhere. The poetic, imaginative and questing spirit, the deeper thoughts and emotions, not easy sentiments, find expression in this great epic. We come across characters, varied and many, who have entered into the bloodstream of our history. They are known also in Indo-China, Indonesia, Cambodia, Thailand and other places. The tangle nature of issues is clear from the fact that in the Mahabharat nobody wants a war and yet nobody could avoid it. It came with all the killings and disaster. But the Mahabharat is much more than a mere description of the blood-bath which was the battle of Kurukshetra. The finest flower of the world chivalry and heroism perished in the flames of war in a matter of eighteen days. The Mahabharat answers these vital questions of life, which grows in complexity as it evolves as if driven by an inner, inevitable logic of its own. The Mahabharat is a great and glorious epic poetry, but even more than its liquid and lyrical quality is the force of its logic, and this is why it overpowers the heart as well as the mind. (source: Indian Culture: Its Triumphs and Tragedies - By H. L. Sharma Mansi Prakashan Meerut. p. 122-123). 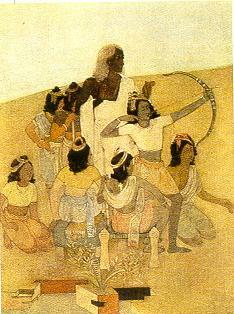 The Mahabharata is the longest epic in the world and has been retold for hundreds of years in various media. The archers above come from a 1990 movie of a dramatic production by British director Peter Brooks. The Mahabharata is undoubtedly one of the greatest works of the world, unique in many ways - unique for the deepest philosophic truths, for the wide range of human life covered by the ethics and for the high spiritual stimulus provided in this epic. It is sometimes called the fifth Veda. The Mahabharata though not technically a revelation, is more than a revelation in the nature of its contents. For one thing it contains the greatest spiritual treasure ever known to the world, the Bhagavad Gita, which may be rightly called the scripture of the world. This alone will suffice to make the epic the greatest work of the world. Apparently it is the story of a war between two rival sections of a dynasty, but its very much more. It is the story of evolution of all life, it is a treatise on cosmogony, a code of universal ethics; it is also a history of the human race in its most general sense. All life is rooted in the One Life; the Devas, Rishis, men, beasts, flowers, rocks, why, everything in this manifested universe are all evolved in that One Life. There is a Great Plan in the mind of God (Ishwara Sankalpa) and everything that was, that is and that shall be, happens in accordance with that plan. Human free will is part of that Plan. (source: Facets of Indian Culture - R. Srinivasan Publisher: Bhartiya Vidya Bhavan p. 214-215). The Mahabharata is the story of the war for the throne between the virtuous Pandavas and their wicked cousins, the Kauravas. It is probably the longest of all the world's epics. The Mahabharata contains about 100,000 couplets, the subject is borrowed from the heroic legend "The Great Bharata Story of War'. Symbolic of the struggle between the Good and the Evil, it recounts the inexorable rivalry between the two branches of the descendants of Bharata. A terrible war took place, in which kings from all over India and neighboring countries participated, opposing the one hundred Kauravas and their cruel chiefs to the five Pandava brothers, allies of Lord Krishna. For 18 days the battle raged with such violence that the heavens seemed to have disappeared behind a veil of flying arrows. The dead accumulated, the Kaurava leaders perished one after another. Thus the five brothers completed their earthly mission; only Yuddhisthira ascended the heaven alive but all others went there after death. An epic with a sad ending but softened by the Hindu notion of destiny. The Mahabharata, one of the great sources of Hinduism, is an account of its beliefs. It is, above all, a verse-chronicle of Krishna, the real hero of the epic, an incarnation of god Vishnu, whose divine nature reveals itself in magisterial interventions. There are hundreds of episodes which fruitfully soften the horror of the Kurukshetra war, full of charm, interposed as a form of digression; and they are based on high social ethics. For example, Damayanti's devotion, tinged with unfailing fidelity, succeeds in saving her husband, king Nala, from the demon of gambling. The deep love of Savitri and Satyavan, Behula and Lakshindar persuades the god of death (Yama) to give back their husbands. But the most admirable and notable is the Bhagavad Gita (the Song of the Lord). In it Krishna, revealing Himself as Bhagavan (Supreme Lord), destroys Arjuna's fear at the moment of going to the battle-field. He teaches him the philosophy of action without attachment, leading to deliverance, by the way of Bhakti, the way of ardent love, of union with the Blessed One, "participation with Him even in life"! (source: Cultural Heritage of Ancient India - By Sachindra Kumar Maity p 6-8). 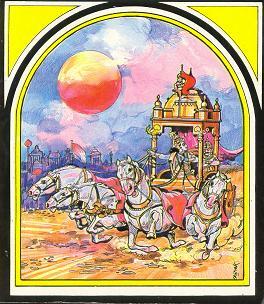 Star Wars the movie has similar themes like the Mahabharata. According to Cie Sharp, Yoda (exact word "yoda" is found in Punjabi (sometimes presumed to be from Sanskrit meaning "warrior") concealed himself in the forest, like a Rishi (the venerable sages of Vedic society), or similar to how the Pandavas spent part of their time when they were in exile from the Kauravas from the "Mahabharat", India's foremost epic which features the "Bhagavad Gita". (source: More Hindu Themes in the "Star Wars" Saga - By Cie Sharp). Horace Hayman Wilson (1786-1860) Eminent Orientalist, in his introduction to Mahabharata, he observed: "By these means, the merit, both poetical and historical, of the Mahabharata are becoming more extensively known; but in the amplitude of it, extant in the numerous traditions, legends and tales which it contains, and in its many didactic and philosophical paragraphs, it offers an accumulation of materials adopted to different tastes, and auxiliary to diverging researches, which must long advantageously engage the attention, and reward the industry, of Sanskrit scholars." (source: Eminent Orientalists: Indian European American - Asian Educational Services. p. 77). The Mahabharata is a treasure house of information on ancient India - it has history, statecraft, religion and mythology all woven into a rich and glorious fabric. 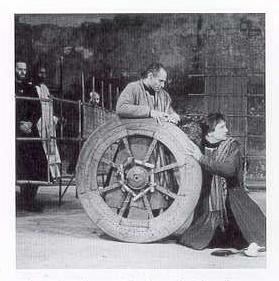 Peter Brooks and his Paris-based theater company produced the Mahabharata, three parts over nine hours in French in 1985. Peter Brooks' Mahabharata at bringing Hinduism to a western society increasingly searching for faddish oriental solutions to life's eternal problems. warm reception to the Ramayana and Mahabharata epics, are the European film and theater audiences. Between 1985 and 1990, these epics have found their way to the public in Europe. They have been top of the bill at the Avignon theater festival. Peter Brooke's Mahabharata, though perhaps not sufficiently true to the original for Indian purists, has been applauded by the viewers, and has been shown on many TV stations also. The BBC has even broadcast the Hindi TV serials. The Mahabharata copies in China sold out, goes into second edition - "There is a growing desire in China to learn about India's culture and traditions." For a long time, Chinese scholars paid too much attention to the West. Now, there is a growing desire to know Indian civilisation and imbibe its wisdom," Huang Baosheng, who headed the five-member team of translators at Beijing University. 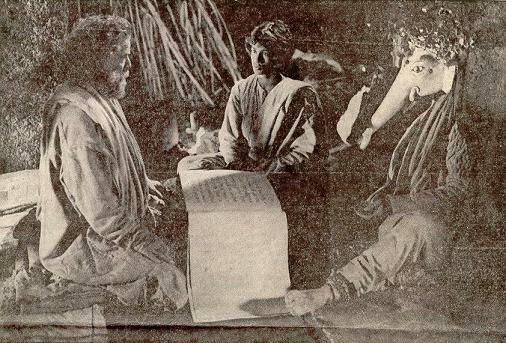 Actors: Robert Langdon Lloyd (as Vyasa) Velu Viswanathan as a hermit and Bruce Myers (as Ganesha) in mini series of Mahabharata (1989). (image source: Philadelphia Inquirer - March 23, 1991). The Mahabharata describes the ideal polity and culture and religion and may be called the Epic of Society and State. 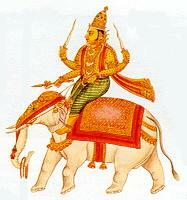 It is called Jaya as it describes the victory of righteousness. There is scarcely a single human situation that it leaves untouched, and it covered most contingencies that mankind could experience till about a few hundred years ago. The Mahabharata is so intensely human, unlike the Ramayana, which deals with ideal types, that it still has a special resonance in the Indian heart. It is a text that one grows with, revealing deeper meanings as one's life unfolds, and a superlative guide to humans trying to work out their entelechy. Its hold on the imagination will never diminish. 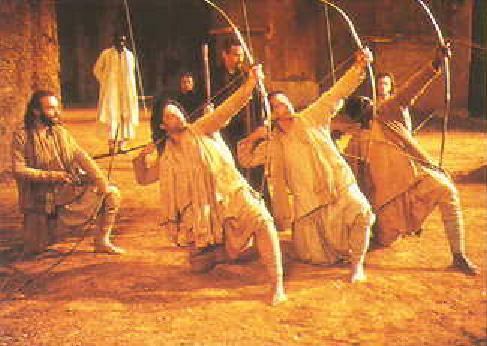 In 1987, theatre artist Peter Brook and Jean-Claude Carriere staged a spectacular 9 hour version of the Mahabharata. It played throughout the world. Shown here a scene between Krishna and Arjuna. The finale of Mahabharat are impressive. Rishi Vyasa concludes: "Dharma is eternal; life, its joys and sorrow are not. Do not give away the eternal for the temporal values of life." — Veda Vyasa, The Mahabharata. According to Thomas Berry, "In quality, in quantity, in significance for man's intellectual, cultural, and spiritual life, this literature in its totality is unsurpassed among all other literary traditions of the world." (source: Religions of India: Hinduism, Yoga, Buddhism - Thomas Berry p. 3-16). Sir Monier Williams wrote: "There are many graphical passages in the Ramayana and Mahabharata, which for beauty of description, cannot be surpassed by anything in Homer....that the diction of Indian epics is more polished, regular and cultivated, and the language altogther in a more advanced stage of development than that of Homer." "Yet there are not wanting indications in the Indian epics of a higher degree of cultivation than that represented in the Homeric poems. The battlefields of the Ramayana and Mahabharata are not made barbarous by wanton cruelties, and the description of Ayodhya and Lanka imply far greater luxury and refinement than those of Sparta and troy." Ramayana and Mahabharata rise about the Homeric poems also in the fact "that a deep religious meaning appears to underlie all the narrative, and that the wildest allegory may be intended to conceal a sublime moral, symbolizing the conflict between good and evil, teaching the hopelessness of victory in so terrible a contest with purity of soul, self-abnegation and the subjugation of the passions." (source: Hindu Superiority - By Har Bilas Sarda. p. 240 -242). Chidambara Kulkarni has written about Vedic literature: "The size and quality of literary works proclaim the greatness of ancient Hindus. Tenacity, hard-work, love of nature, thirst for knowledge, clarity of thought are several features of the Aryas reflected in the literature. The fact that the literary works were learnt and taught by oral method speaks about their devotion to literature, learning and teaching. The Vedic literature is very wide in scope and quite deep in insight and analysis." (source: Ancient Indian History and Culture - By Chidambara Kulkarni Orient Longman Ltd. 1974. p.56). The beautiful literature of the Hindus took thousands of years to develop. It raised the the status of Indian civilization and culture. Without knowing this one cannot know the inner soul and glory of India. 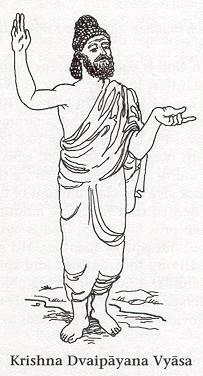 Speaking only of the vast Vedic literature, the wonderful manifestation of human genius through hearing alone, Maurice Winternitz says: "As the Veda, because of its antiquity, stands at the head of Indian literature no one who has gained an insight into the Vedic literature can understand the spiritual life and culture of the Indians." Rig Vedic literature reveals an advanced civilization pointing to a description of settled people, an organized society and a full grown civilization without reference to a single allusion to migration. Hindu Scriptures tell us how ancient rishis (sages) experienced the divine reality and how they responded with exuberant joy, confidence and a feeling of intimacy. This literature is not primitive but highly developed in its literary form, in its intellectual insight, and in its questioning attitude. The glory of this literature is its imaginative and emotional qualities. There is a religious mood in the longer hymns to Varuna, an awareness of divine might in the hymn to Indra, a special radiance and loveliness in the hymns to Usha, the goddess of Dawn. When these texts were translated they won admirers amongst some of the best minds of Europe. In some cases, they even turned the Christian apple-cart. After reading them, Schopenhauer found the Upanishads the "solace" of his life and death, and Kant found the Hindus were "gentle", that "all nations are tolerated amongst them." These texts won the admiration of Emerson, Thoreau, Walt Whitman, Tolstoy, Victor Hugo, Romain Rolland, Hermann Hesse, Henrich Zimmer, Sir Edwin Arnold, Yeats, Carl Jung, Toynbee and many others. The first harbinger of American religious freedom in Masssachusetts, Henry David Thoreau is said to have come across a fresh translation of the Gita by Burnouf but certainly the one by Charles Jones which had just been published those days. In disillusionment of Christianity, he wanted to carry his new religion to the end of the earth. His new religion was the Gita. H. G. Wells has remarked: "The history of India for many centuries had been happier, less fierce, and more dreamlike than any other history. In these favorable conditions, they built a character - meditative and peaceful and a "nation of philosophers such as could nowhere have existed except in India." (source: The Outline of History - By H. G. Wells p. 855). Alain Danielou observes that: "The sheer volume of Sanskrit literature is immense, and it remains largely unexplored. Probably we shall never know well our own history over the past five millennia until this immense reservoir of Sanskrit documents have been tapped. Many text disappear every year, since the manuscripts are highly perishable in India's extreme climate, and the teams of scholars who once used to recopy damaged manuscripts for the libraries have almost entirely disappeared." (source: Virtue, Success, Pleasure, Liberation - By Alain Danielou p. 16-17). The Veda, taken as a whole, is the main source or the fountain-head of all Indian culture. Its philosophical speculations lead to the Vedanta. Its forms of meditation and prayer leas to the Bhakti doctrine, its rituals and sacrifices lead to to the Purava Mimamsa school, its accounts of creation lead to the cosmology and pyschology of samkhya, its descriptions of religious ecstasy lead to the Sadhanas of Yoga and its metaphysical disquisitions lead to the reasoning of Nyaya and Vaiseshika. And, just as all our scriptures have a common source, they have a common aim - to make man a perfect being, god-like and one with him. To download Hindu Scriptures - refer to Hindu Temple of Greater Cincinnati. Refer to Stotra Rathnas. The ancient bards and rishis of India didn't need Smart Drugs. These vast epics, and the four 'books' of the Vedas, were originally transmitted by a phenomenal human chain of memory, and only written down centuries after their actual compilation. The early phase of the Vedic tradition in India is dated between 10,000 - 7,000 BCE. This oral tradition still exists in India today. The Rishis who recited the great and long epics (The Ramayana and The Mahabharata) did not need any "smart" drugs to keep their memories powerful. Their well-toned memories bespoke tomes: The Rig Veda and the Mahabharata, among thousands of hours of other recited epics. (source: Seeking "Smart" Drugs - Exploring Intelligence - By Scientific American - November 1999 issue p. 39-43). The collection of hymns and the immense mass of literature were preserved by means of oral tradition only. Vedic hymns are used today at Hindu wedding ceremonies, in an astonishing example of continuous tradition. The feat of memorizing and handing down a vast amount of oral literature is a hallmark of Hinduism. The Vedas were handed down from mouth to mouth from a period of unknown antiquity. 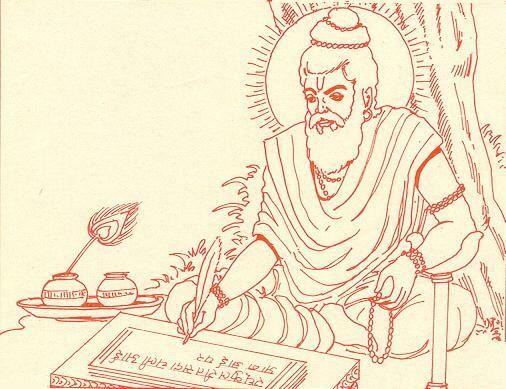 When the Vedas were composed, there was probably no system of writing prevalent in India. But such was the zeal of the Brahmins, who got the whole Vedic literature by heart by hearing it from their preceptors, that it has been transmitted most faithfully to us through the course of more than 4,000 years with little or no interpolations. This is unique monument to their tremendous memory. One of the conspicuous feature in ancient Indian education as it used to be, was the training of memory. Education, was by means of oral instruction and the learning by heart of classic literature. The learned men did not rely upon his library, but upon his memory alone. The memory thus trained and relied upon was capable of marvelous feats; even now there are men who know by heart hundreds and thousands of verses of Sanskrit literature which they have learnt once and never forget. (source: Essays on National Idealism - By Ananda K. Coomraswamy Munshiram Manoharlal Publishers.1981 p.109).